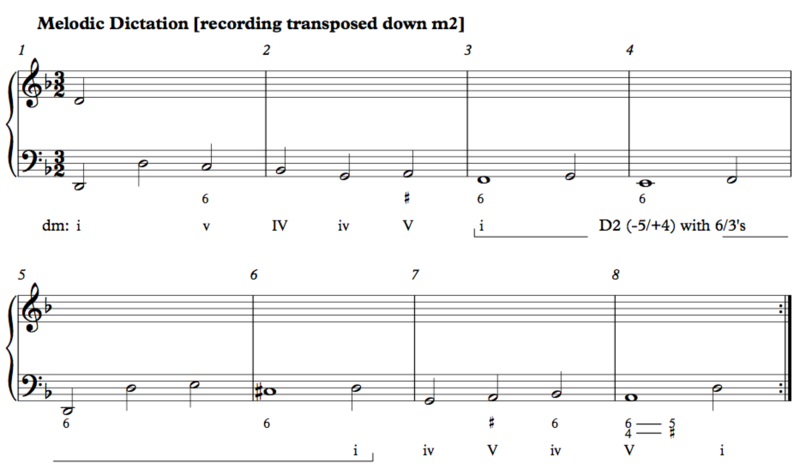 The following excerpts (over 200) are intended to serve as a resource for tonal dictation practice for a two-year undergraduate sequence. 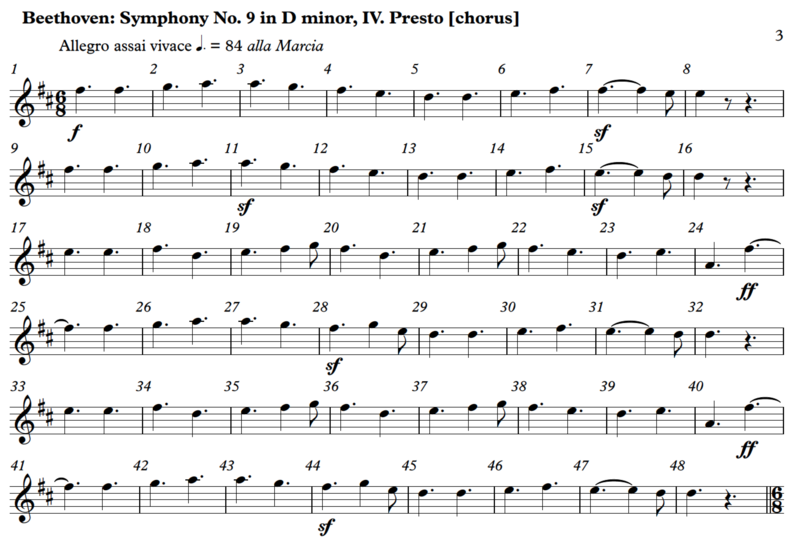 Special preference is given to woodwind and brass instruments, with some orchestral and vocal excerpts as well. 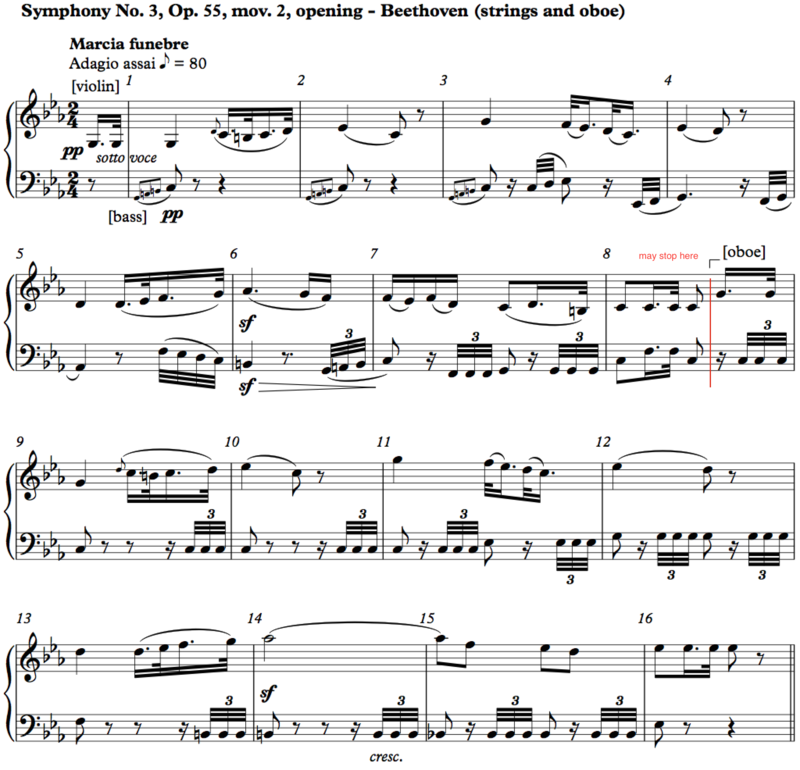 Solo piano and string quartet repertoire by Haydn, Mozart, and Beethoven has been purposefully deemphasized, since these categories are usually well-represented in the written theory classroom. 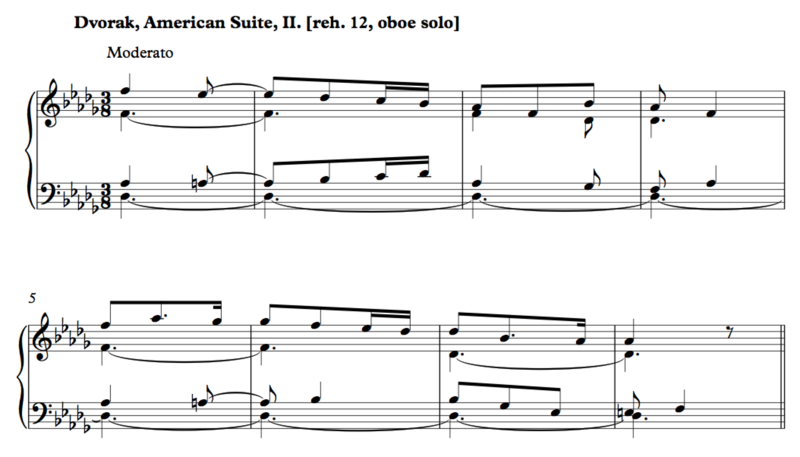 A secondary goal of this collection is to expose students to more repertoire, although a limiting factor was the difficulty of many famous pieces. 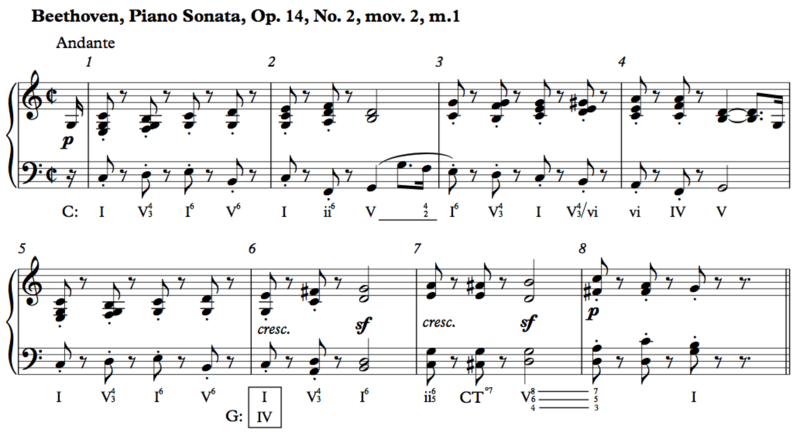 Rather, preference is given to excerpts that have memorable tonal melodies at moderate tempos. 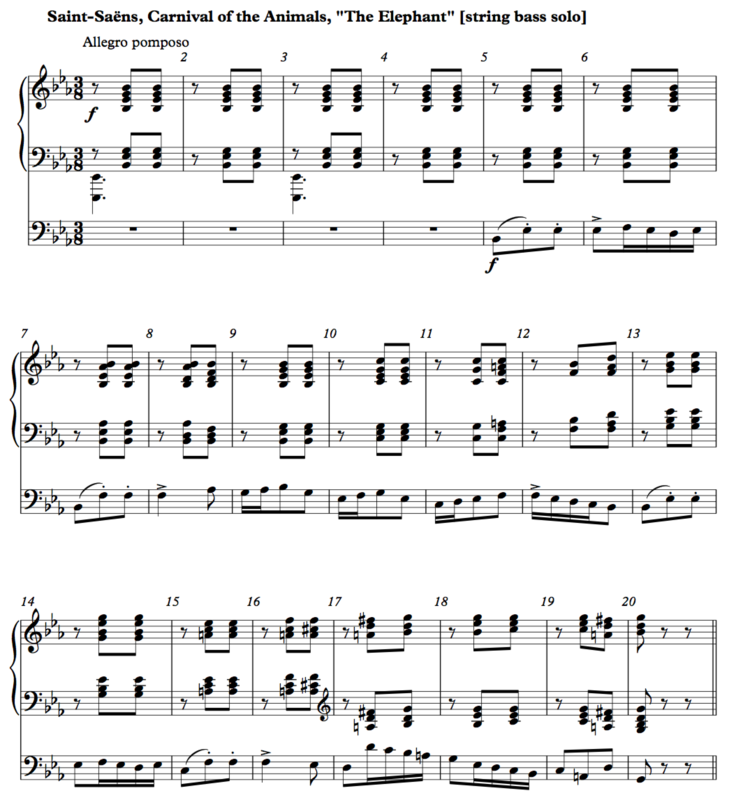 And since I wished to include the original score for reference, excerpts mostly had to be in the public domain to be on IMSLP, which means they were published before about 1940. 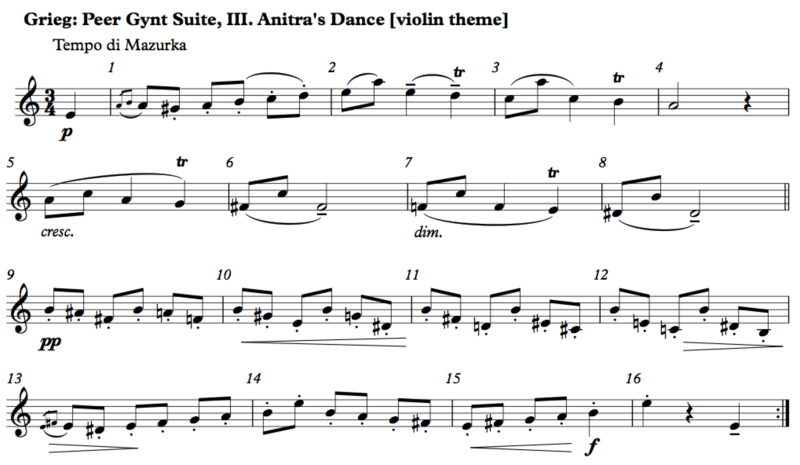 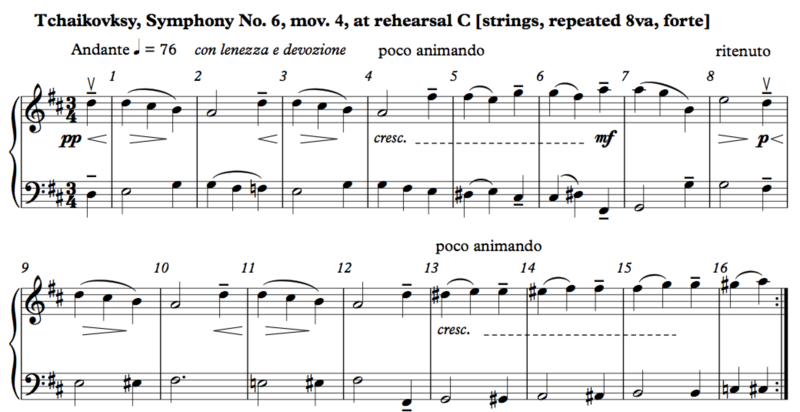 Audio has been edited from recordings available on Youtube (with performers indicated), and PDF or PNG scores are provided for the student and the instructor, as well as of the original score, when available. 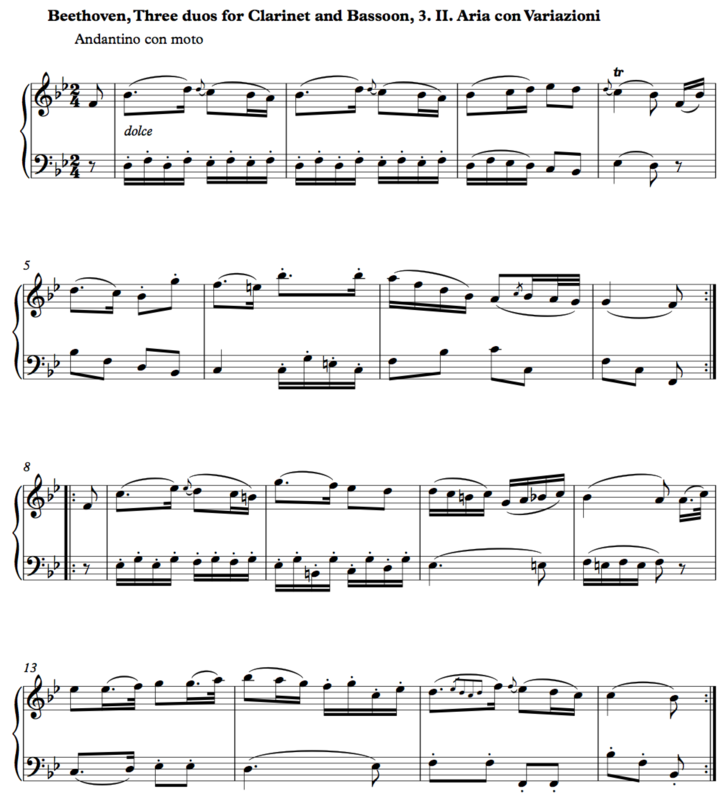 A word about copyright: this collection falls under the “fair use” clause since it is for education, has not been monetized, is password protected, and only includes small parts of the original recordings and scores. 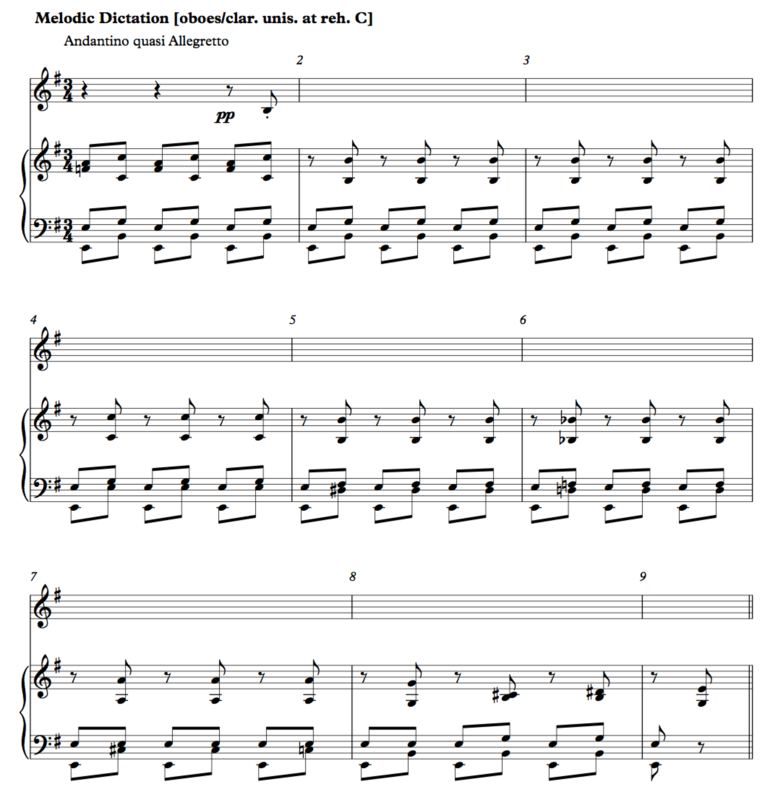 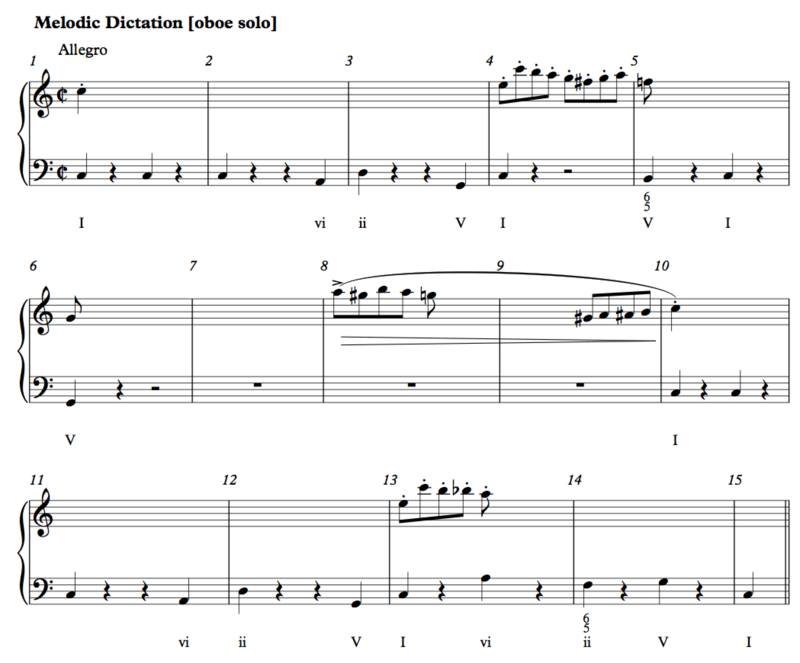 Most aural skills teachers rely on non-repertoire-based dictation exercises primarily played in person on the piano. 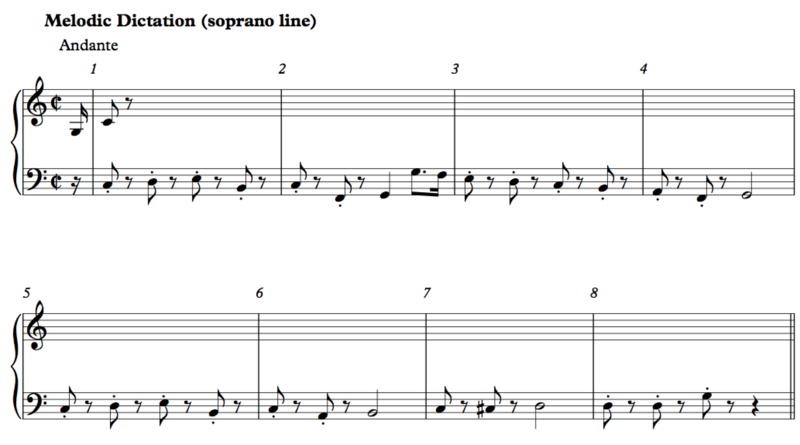 The advantages to such an approach are that it’s simple (low-tech) and important lines can be voiced-out easily by volume or register (it is often useful to play the bass down an octave on the piano for bass dictations). 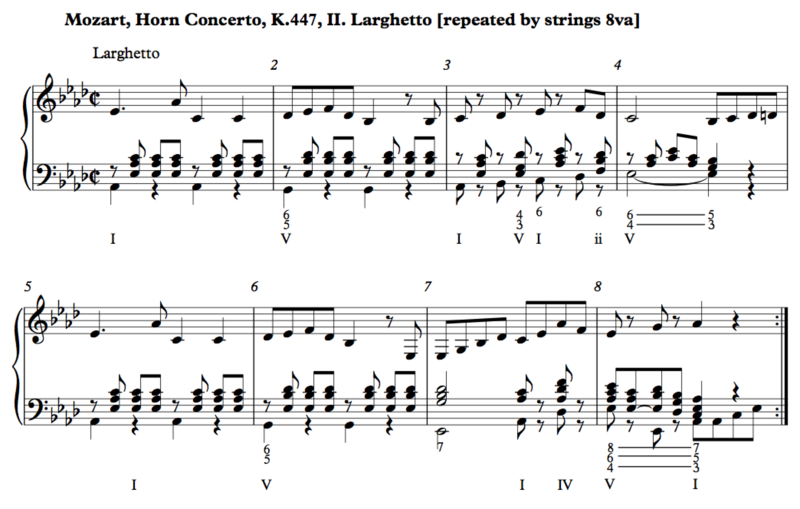 I believe the main reason teachers don’t use repertoire more is because it is a lot of work to seek out and prepare recordings and scores for students. 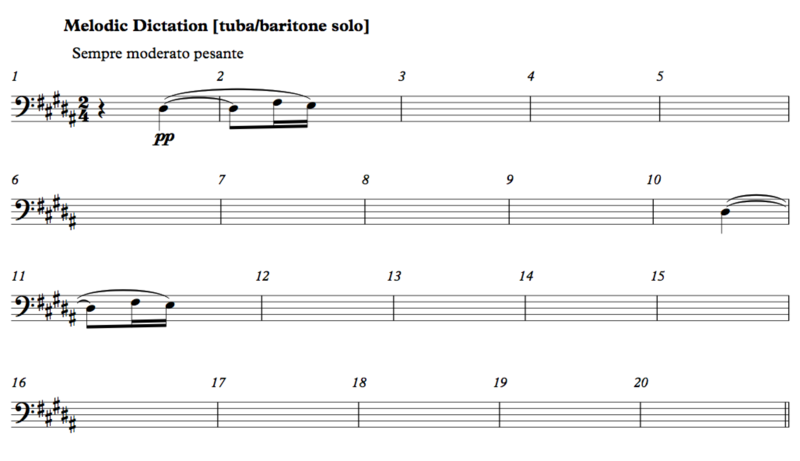 My hope is that this collection can fill this need. 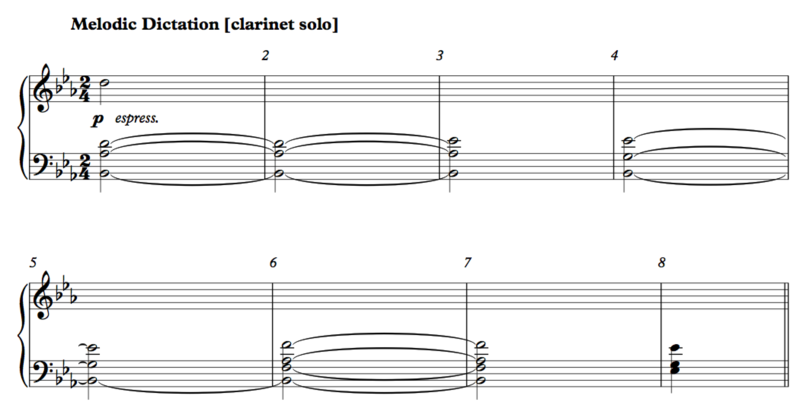 Still, there are pros and cons to this approach. 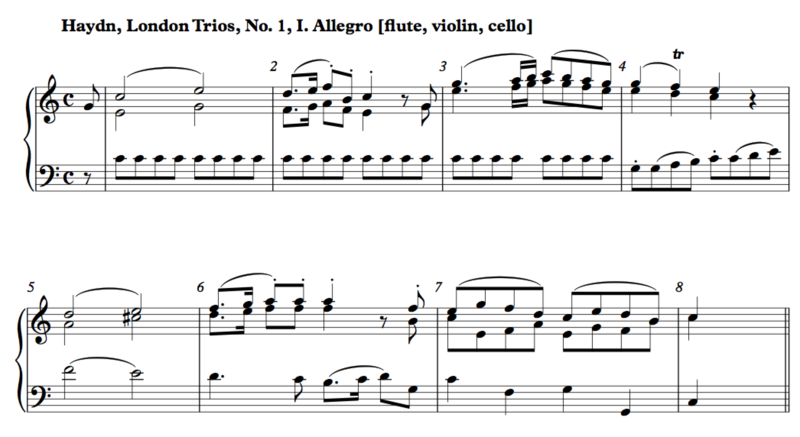 My hope is that this collection will solve the first two disadvantages. 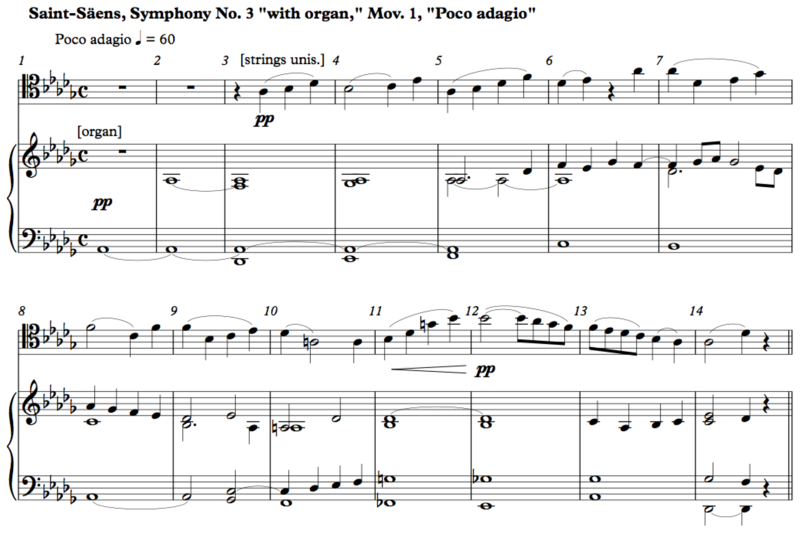 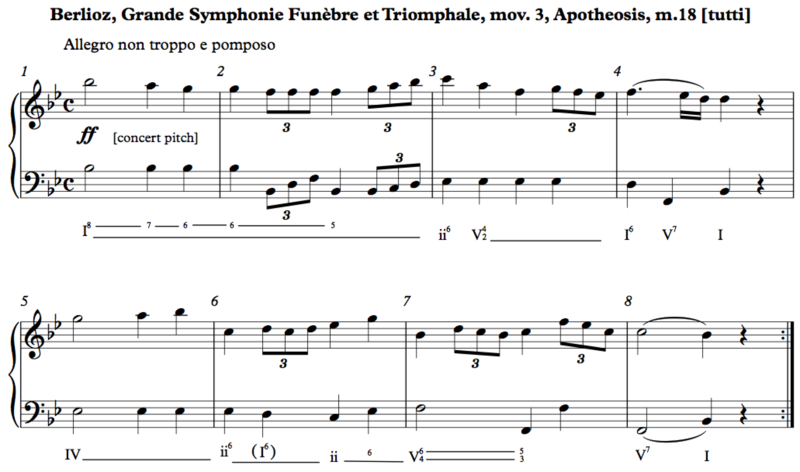 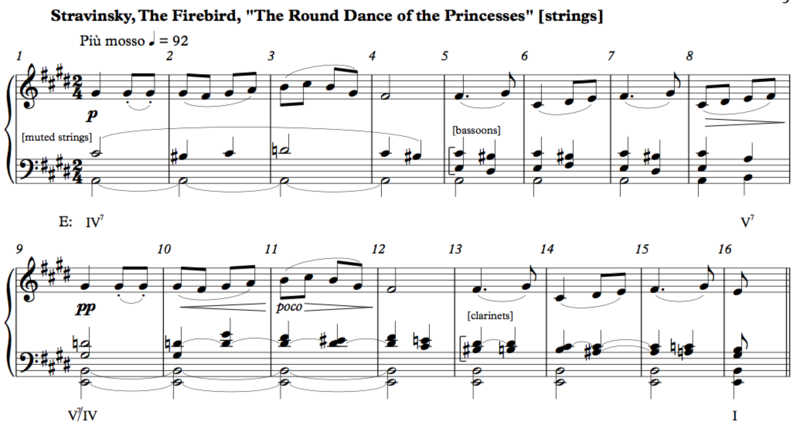 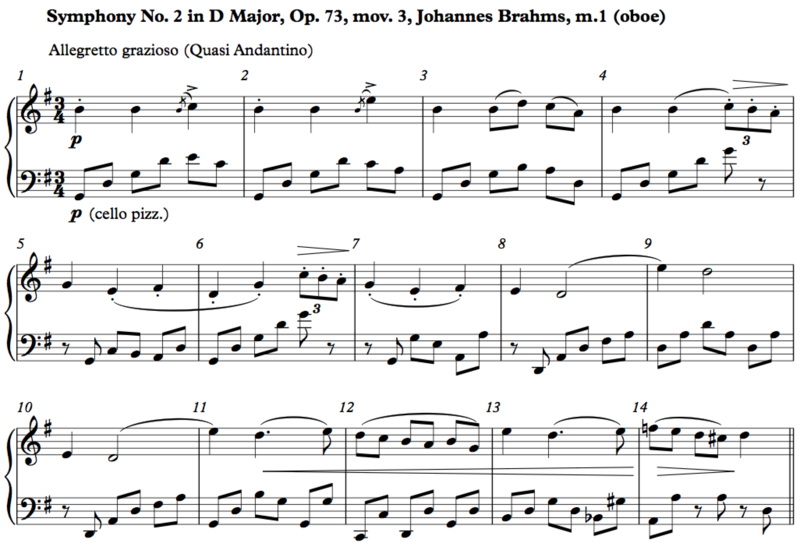 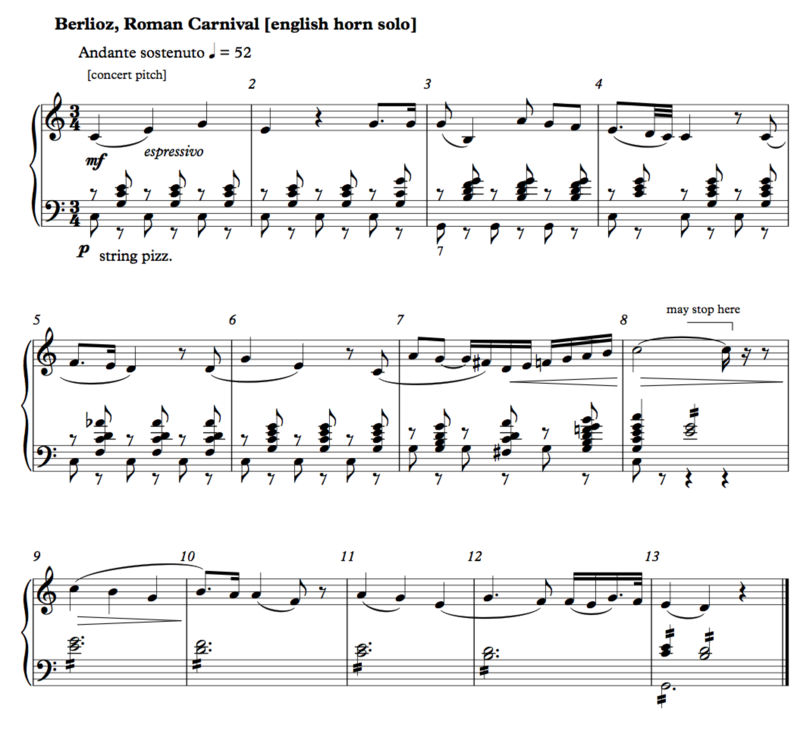 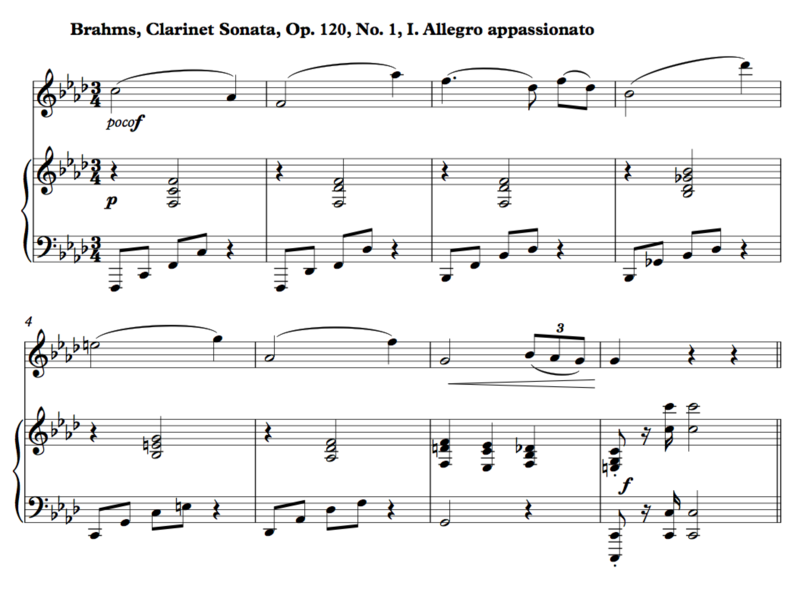 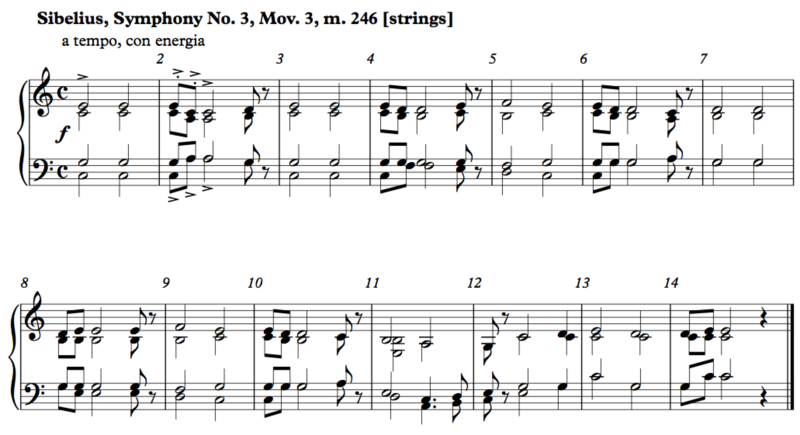 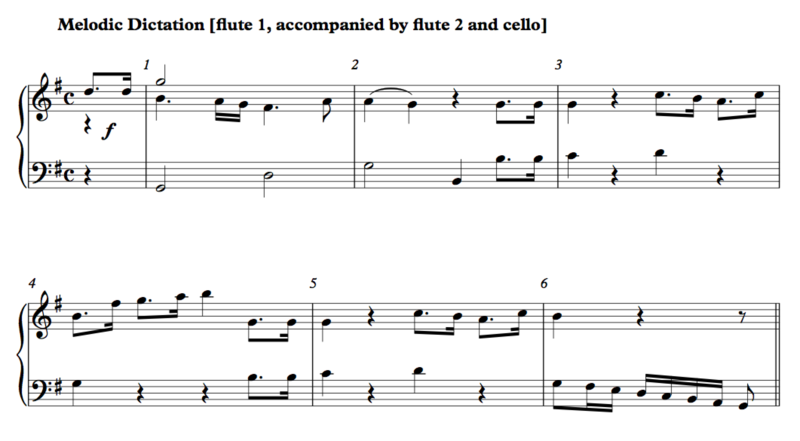 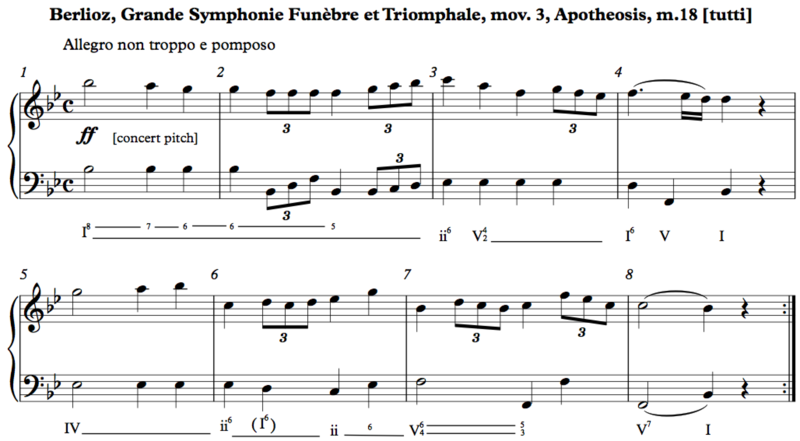 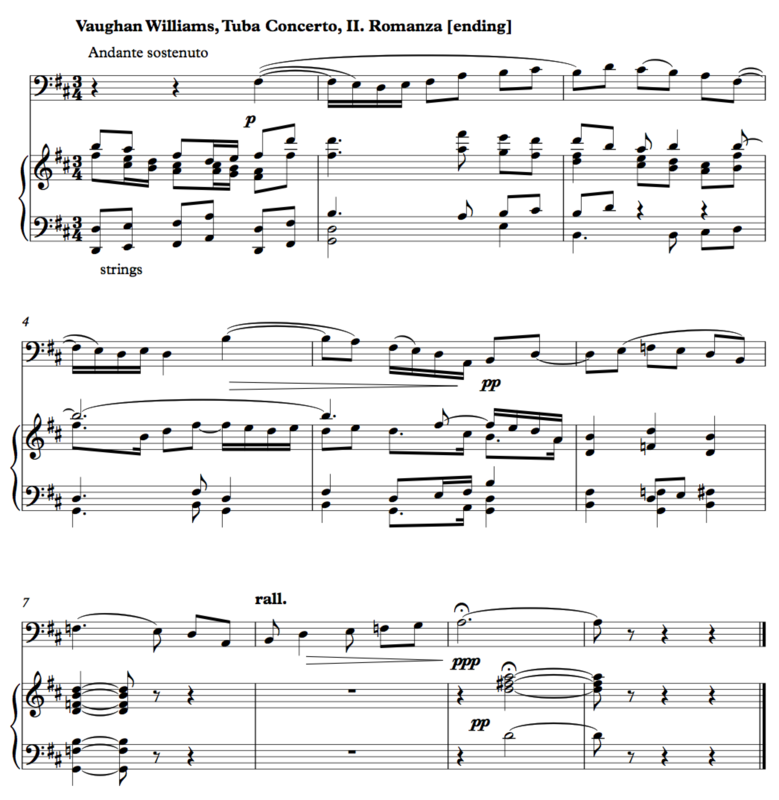 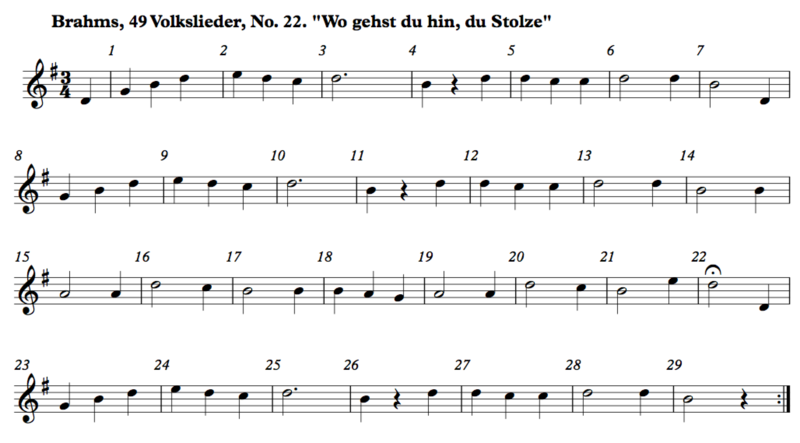 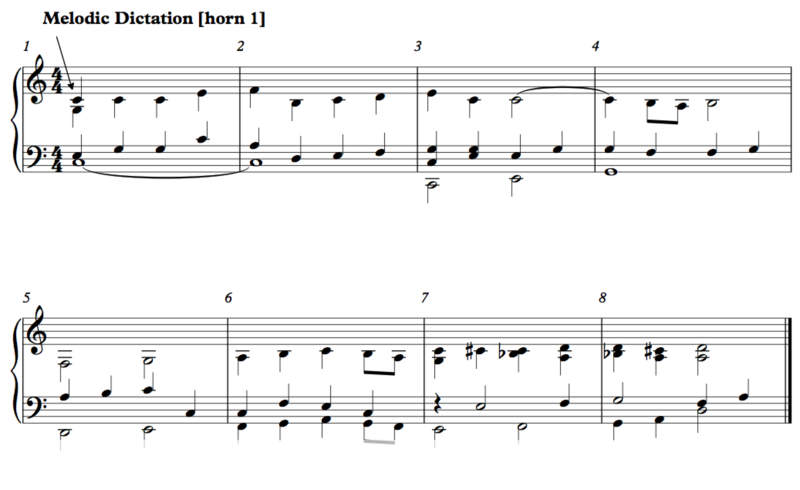 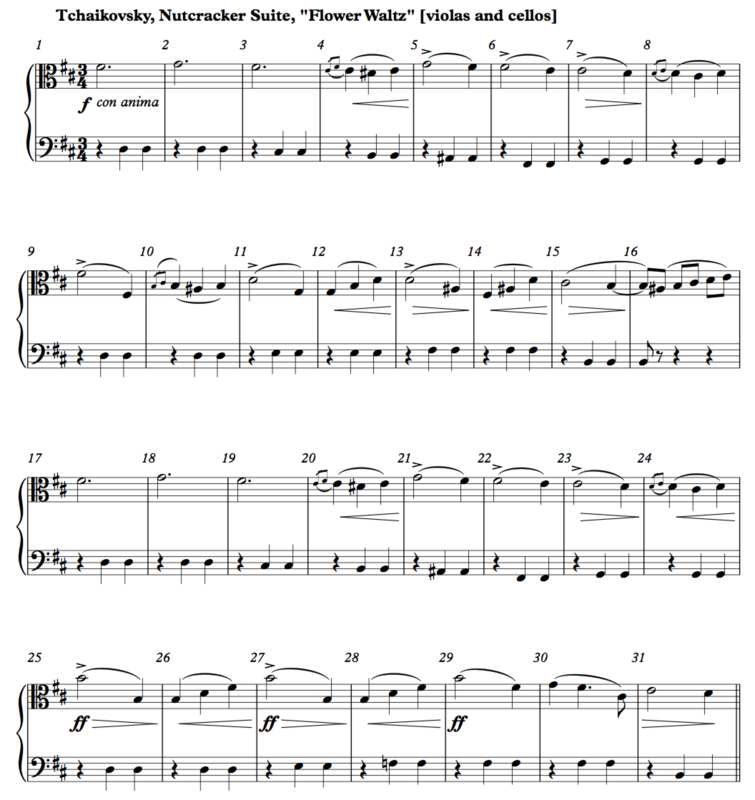 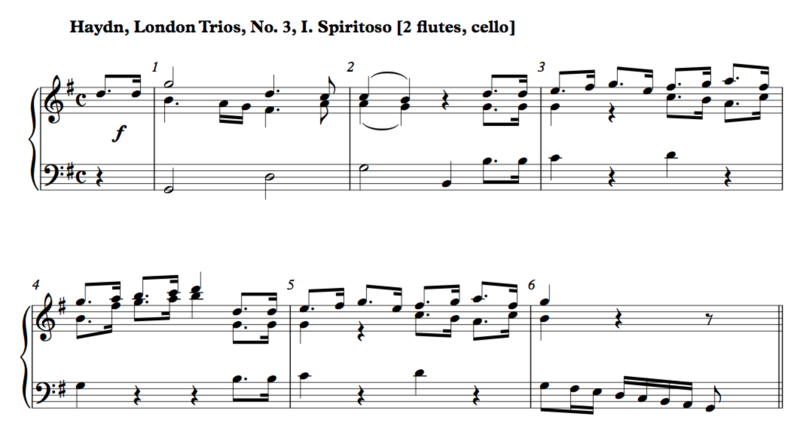 Regarding the third, the student will still have to transcribe the melody from his or her own memory. 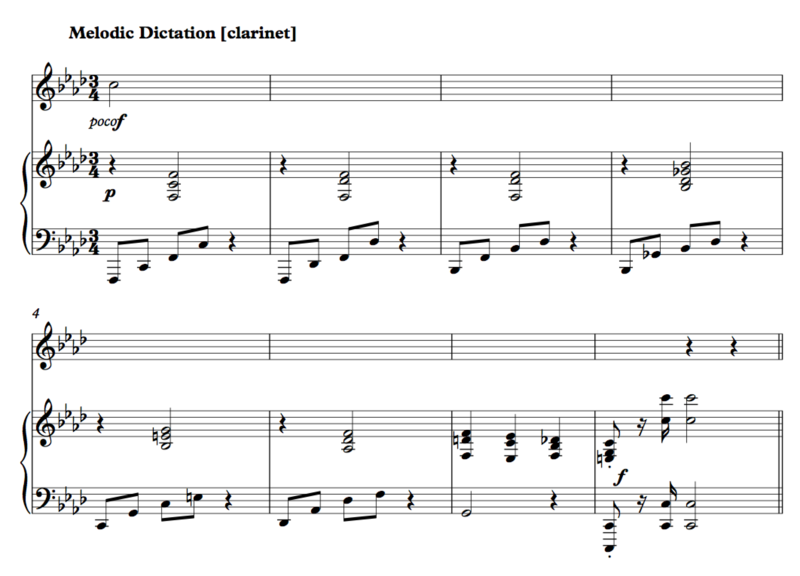 Transcription is the primary objective of dictation; the memorization is only the first half the task. 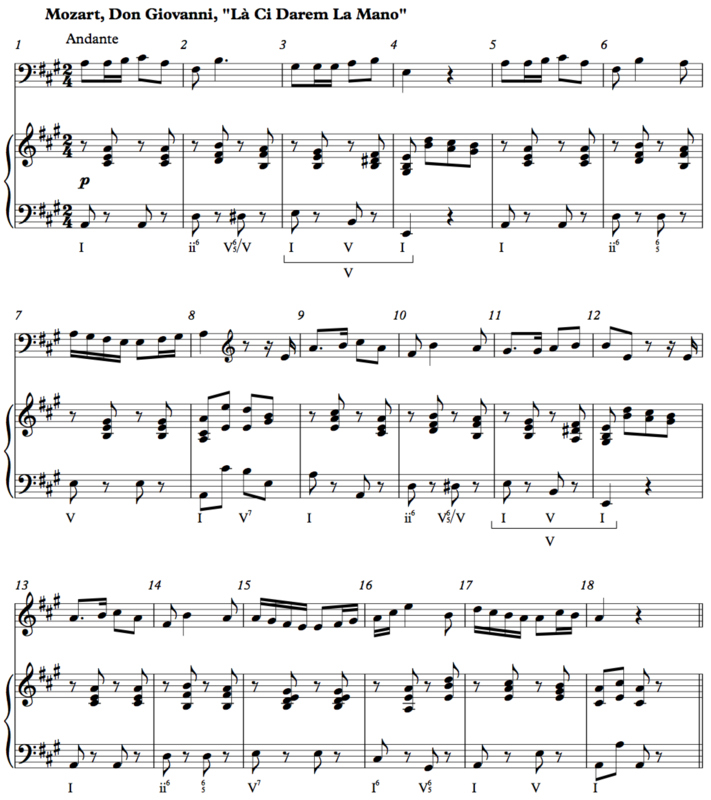 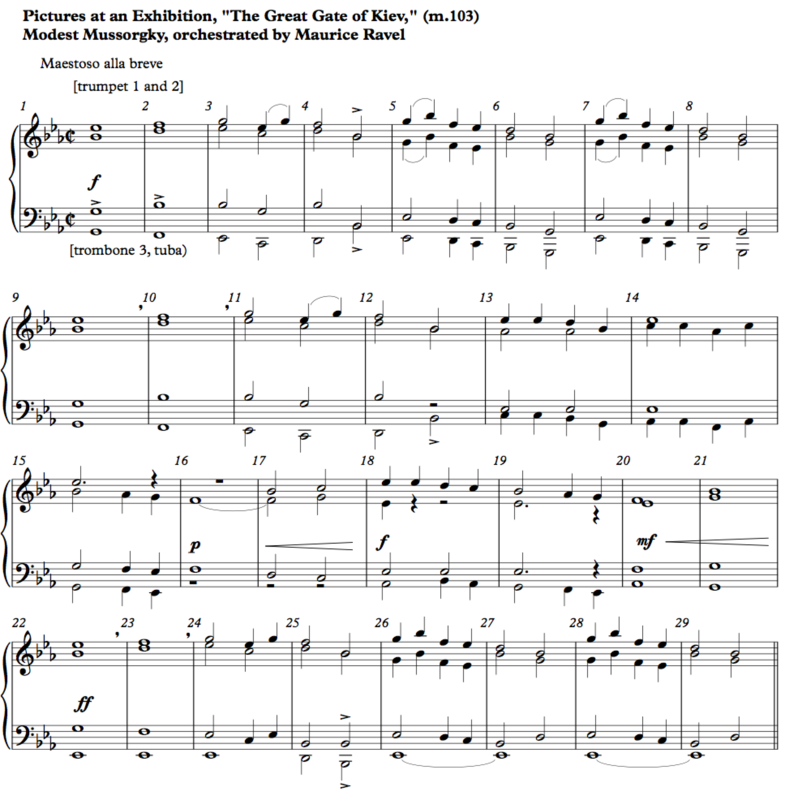 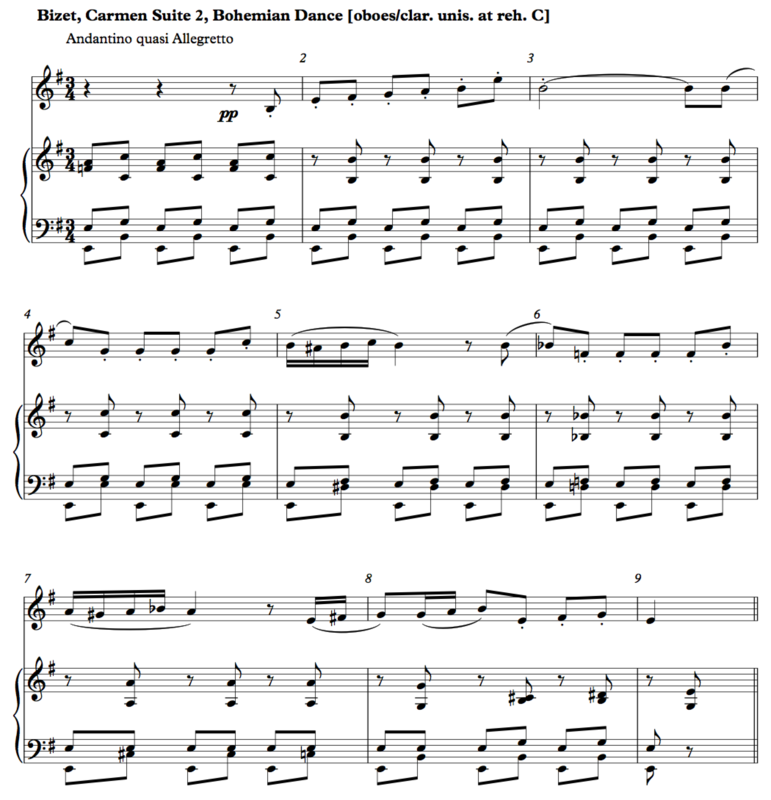 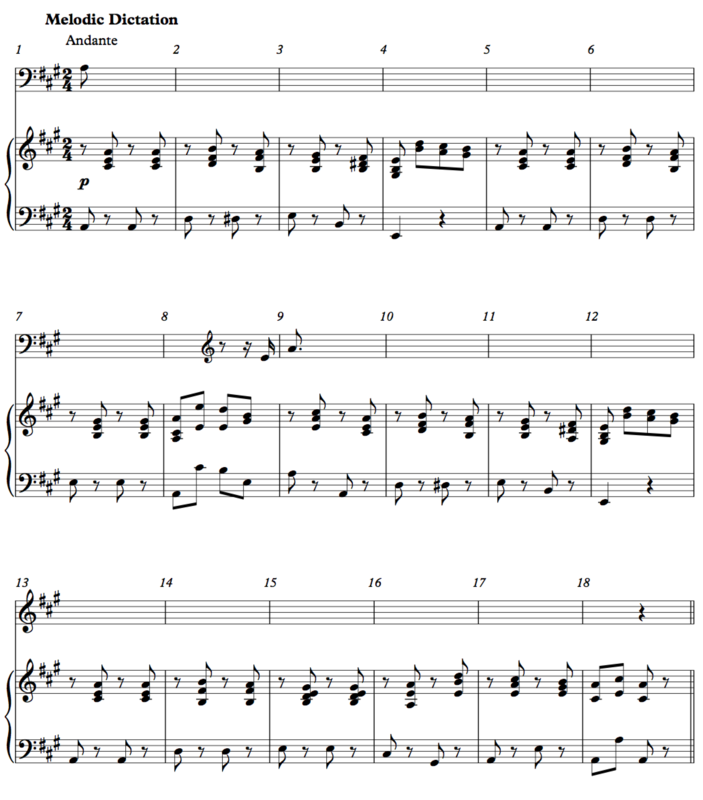 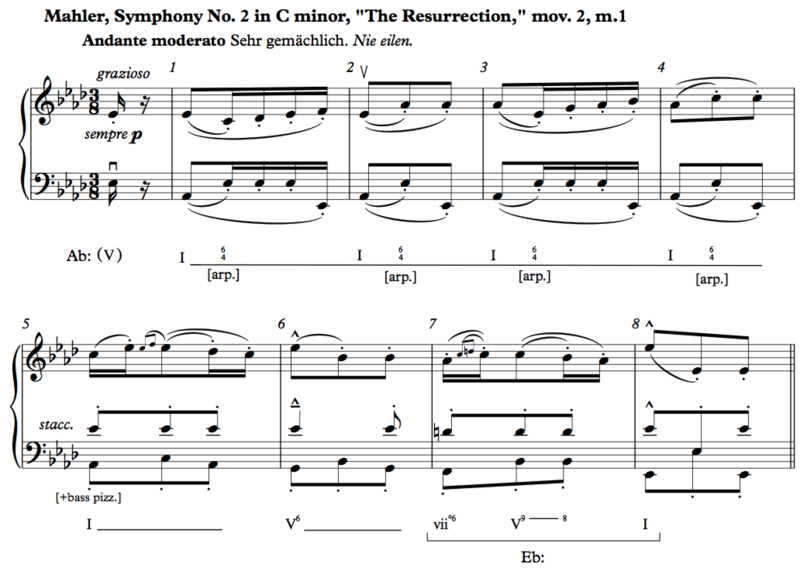 To that end, familiar tunes (“Happy Birthday,” “Mary Had a Little Lamb”) can be used in the initial stages, played at the piano, to skip over the memorization step. 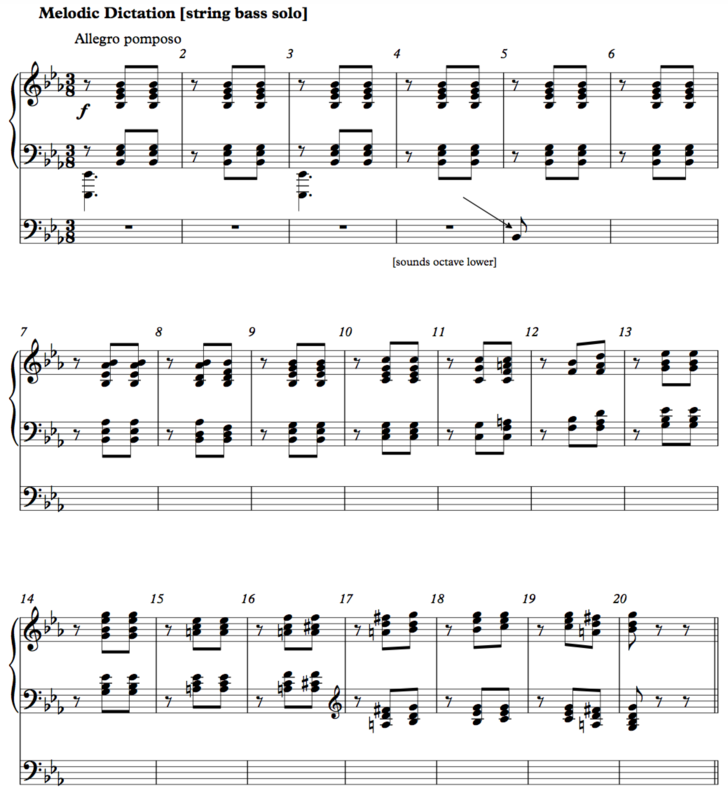 Concerning technology, the students’ blank score could be projected on the wall, and students copy the information to their own paper (saving the teacher making photocopies). 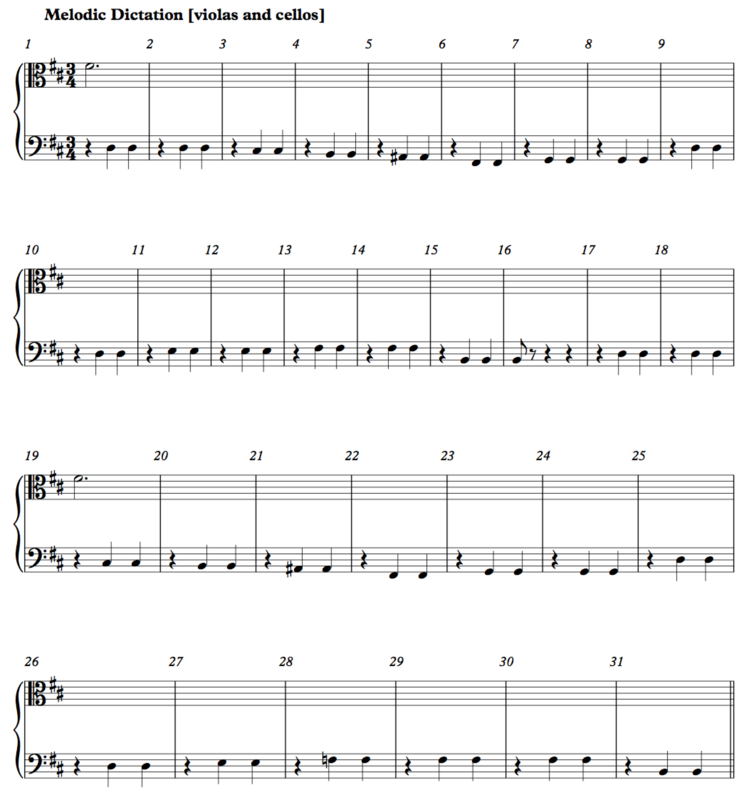 Then, the example would be played any number of times, and finally the solution is projected and students correct their work. 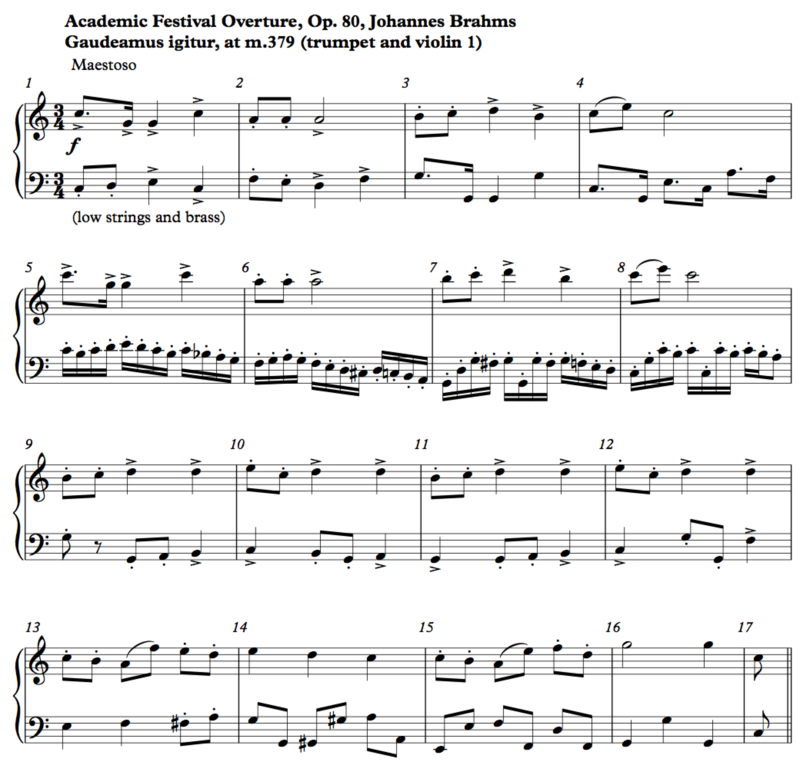 Alternatively, scores may be provided for students, which saves class time. 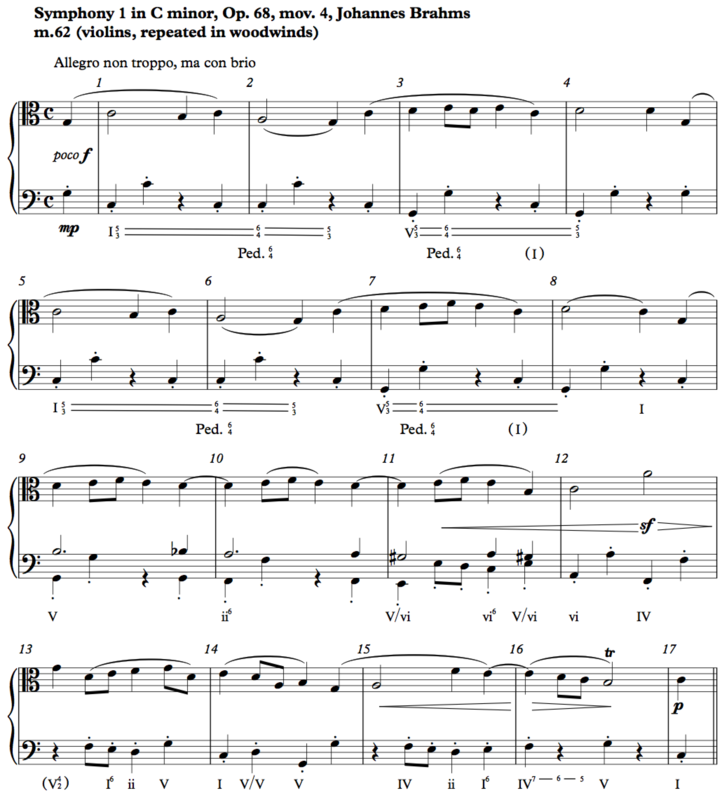 Answers might be printed on the back of the paper so students can correct their own work. 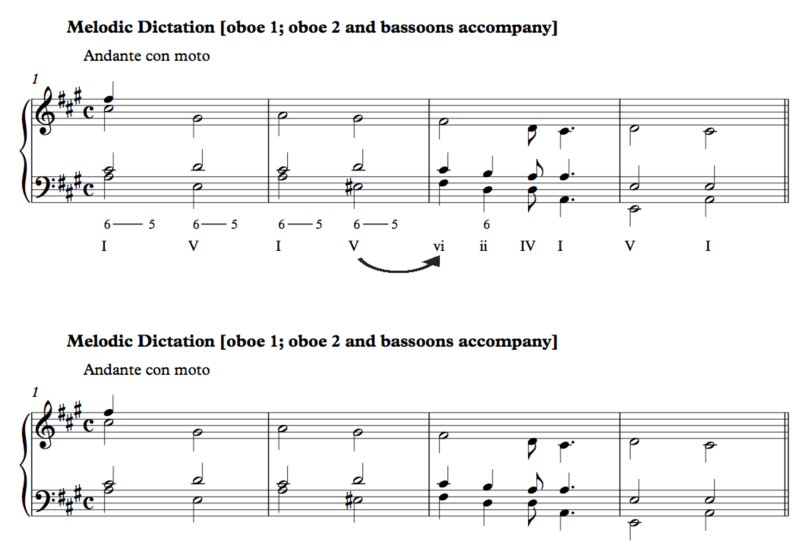 For “take-home” dictations (see below), files can simply be emailed to students as a link. 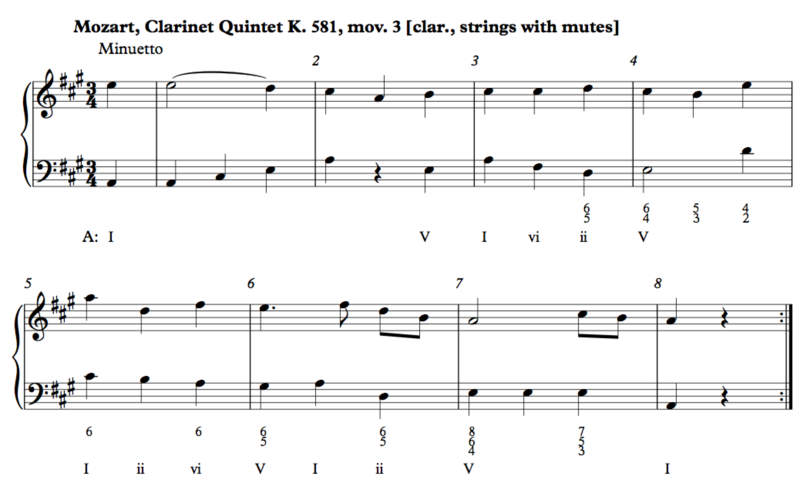 In my experience, preparing photocopies beforehand is undoubtably the most efficient use of class time, since much time is wasted with the perpetual questions of “What key? 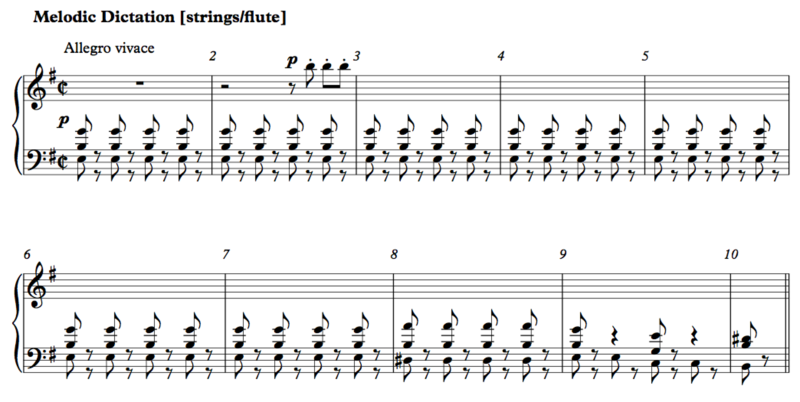 How many bars? 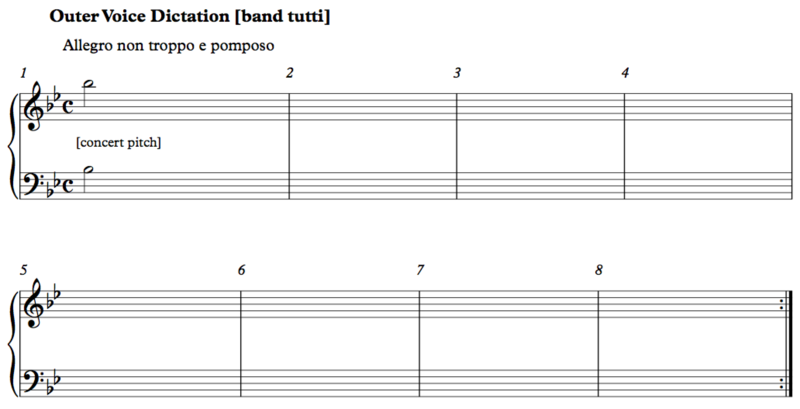 What time signature? 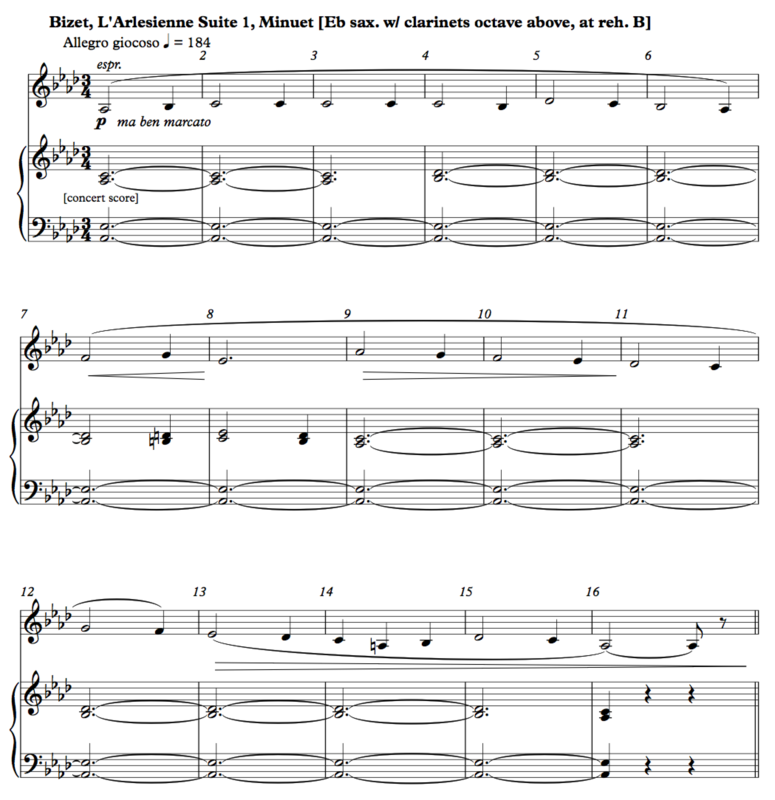 Is there a pickup?” Then more precious minutes are wasted as students ask neighbors for staff paper and have to draw empty measures. 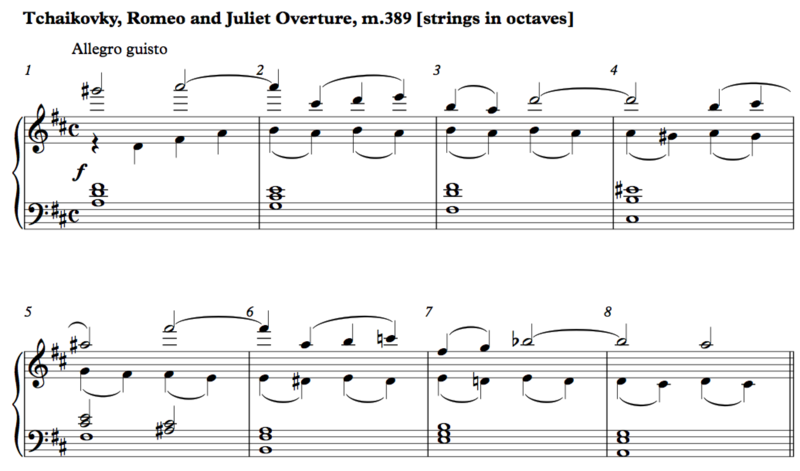 Naturally, PDFs and PNGs for students do not include the name of the excerpt. 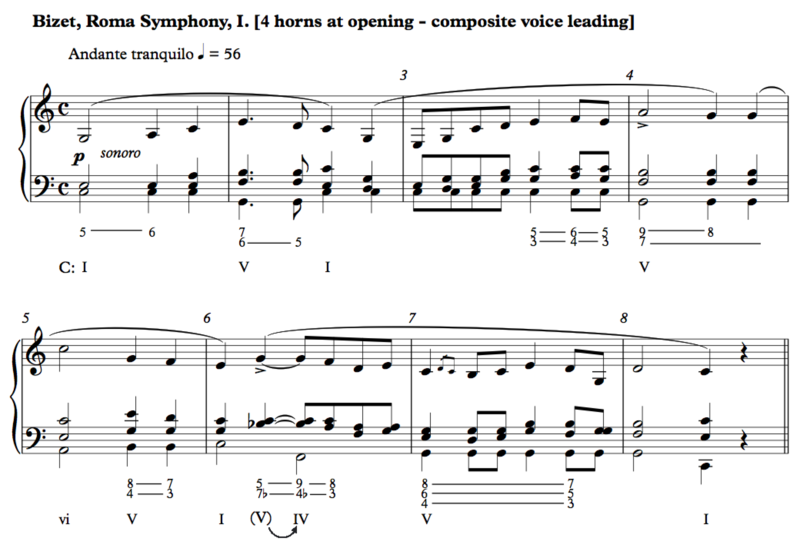 In most cases, a first pitch is given; in others, additional clues, such as a harmonic analysis, an ornament, or a rhythm may also be provided. 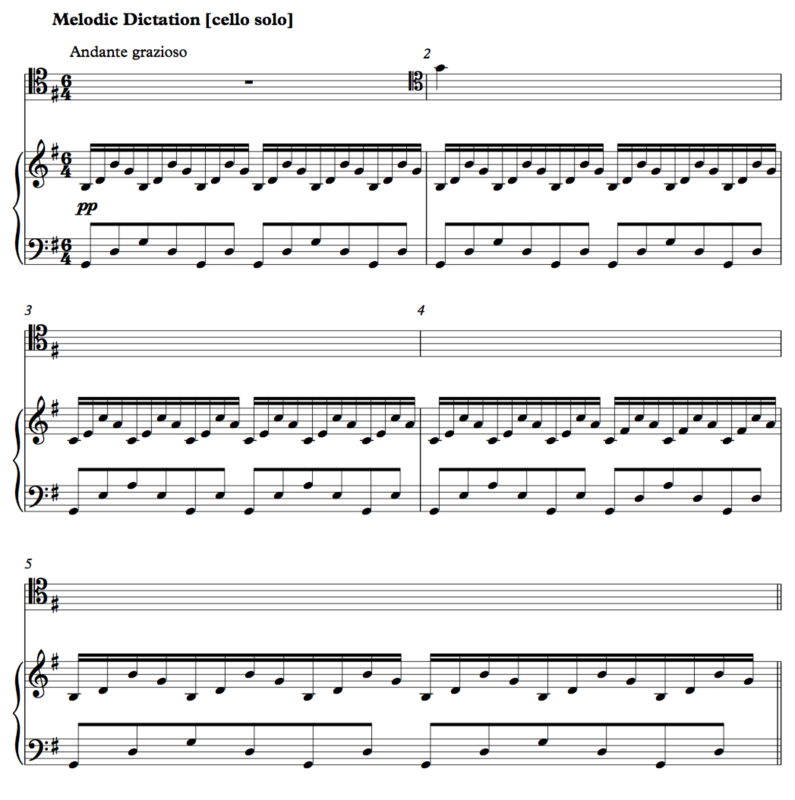 Many students suffer from extreme anxiety when it comes to dictation, and providing the first pitch greatly increases their chances of success. 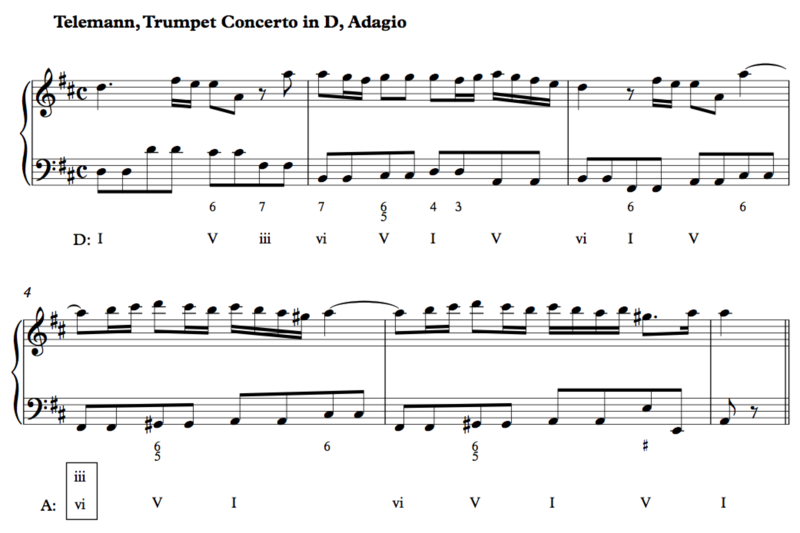 And often when students do have the right starting pitch, they write in the wrong octave anyway. 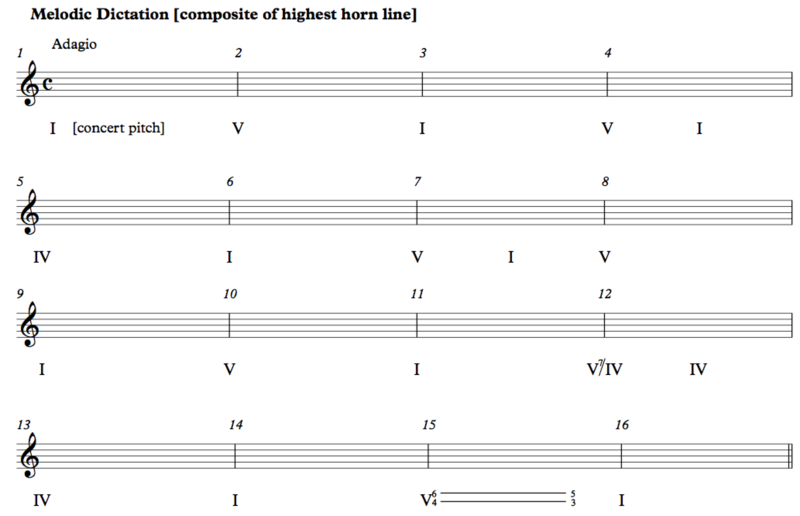 The length and approximate range of the melody are indicated. 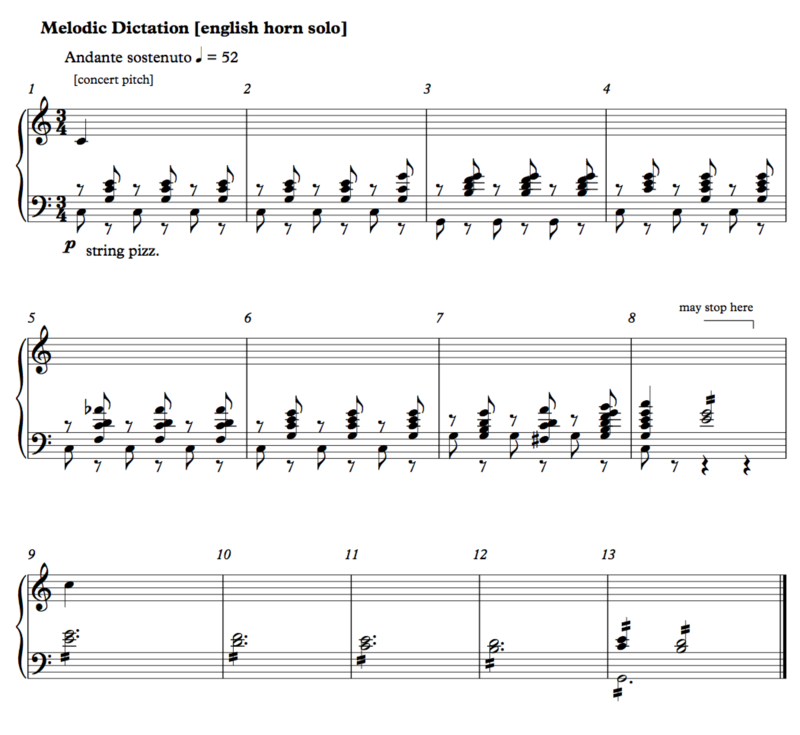 The longer melodies may be assigned as a “take-home” dictation, meaning the student may listen as many times as they wish at home. 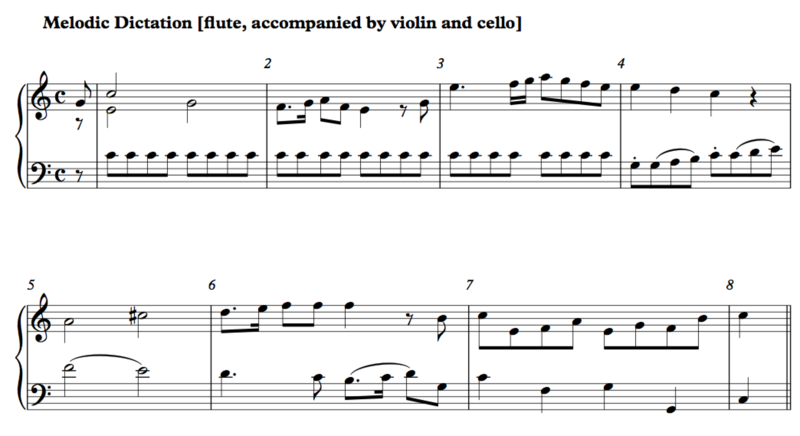 (But be aware that direct links to the file on this website will include a folder name with the excerpt’s title.) 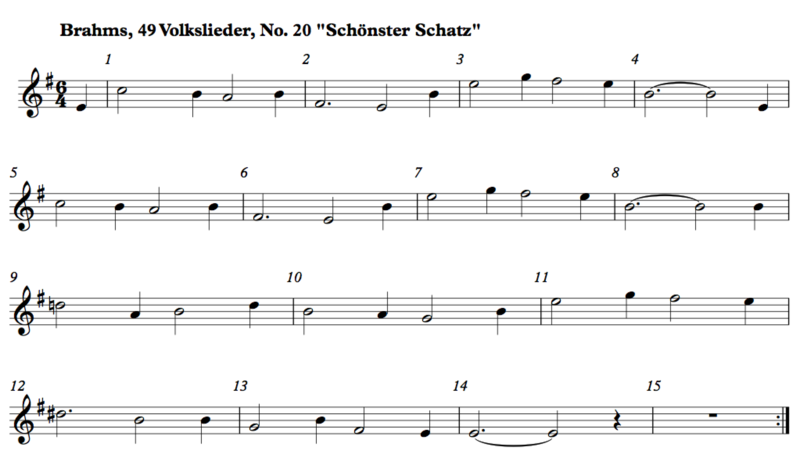 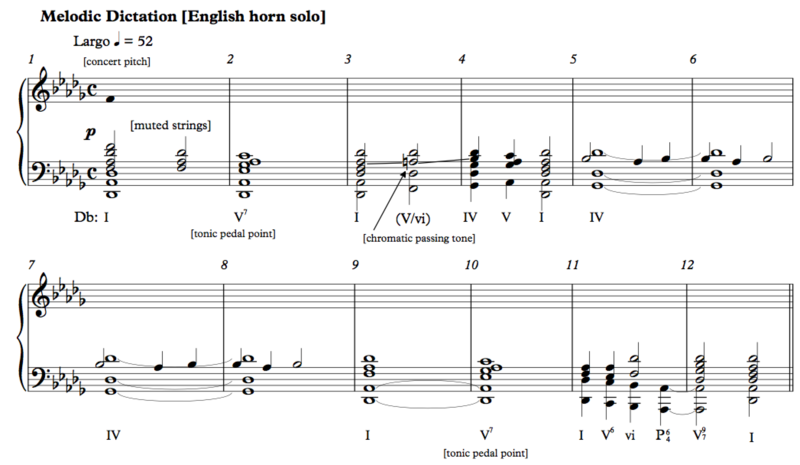 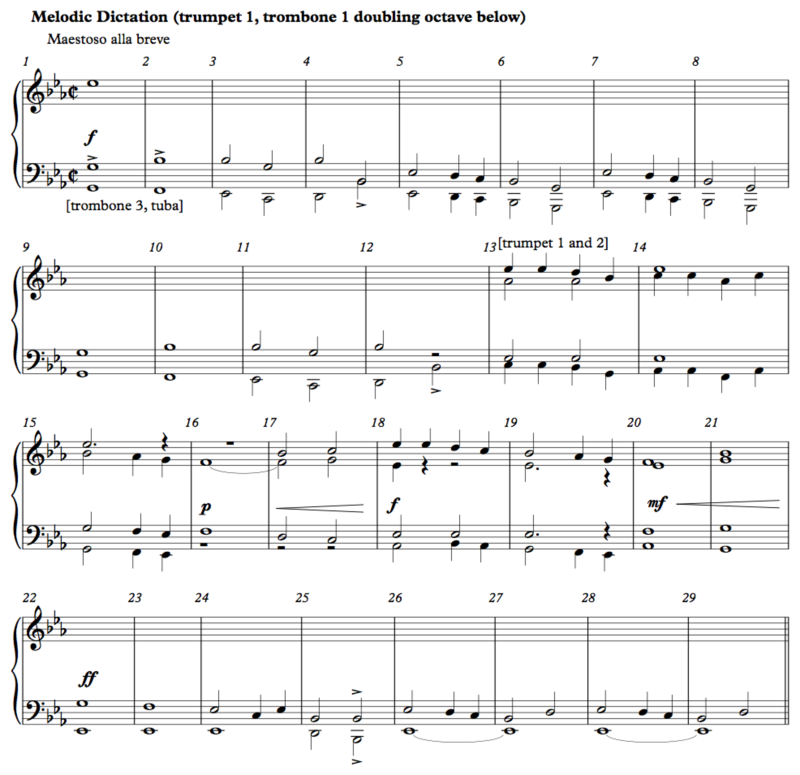 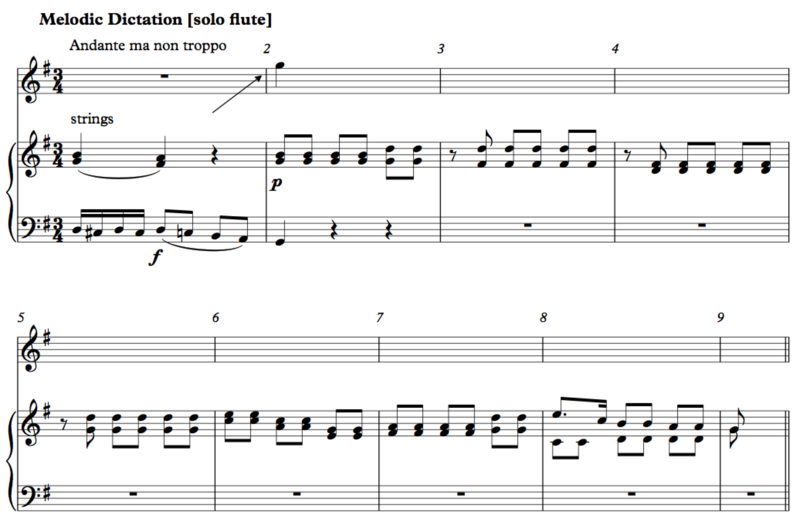 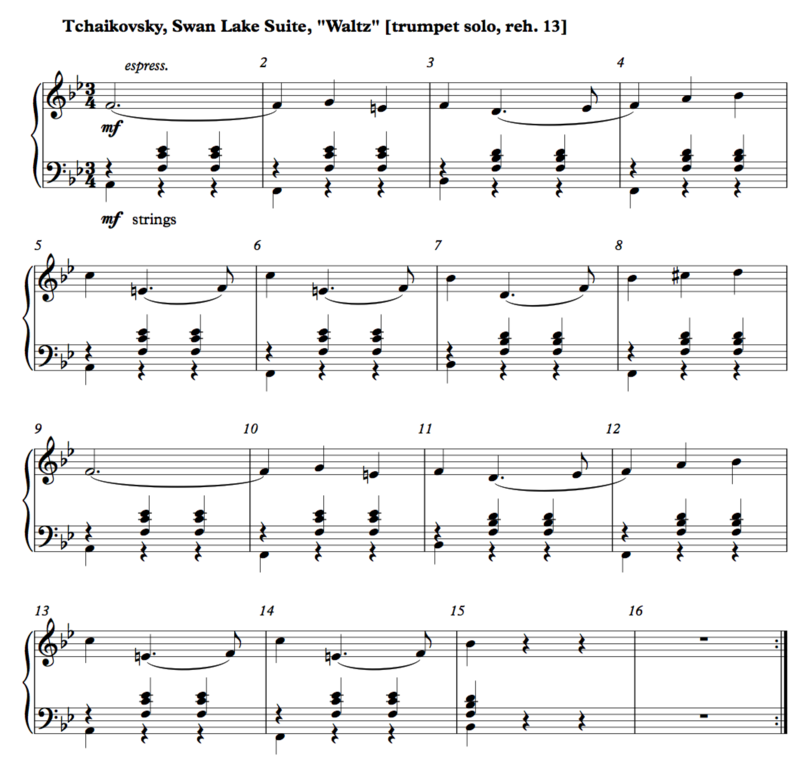 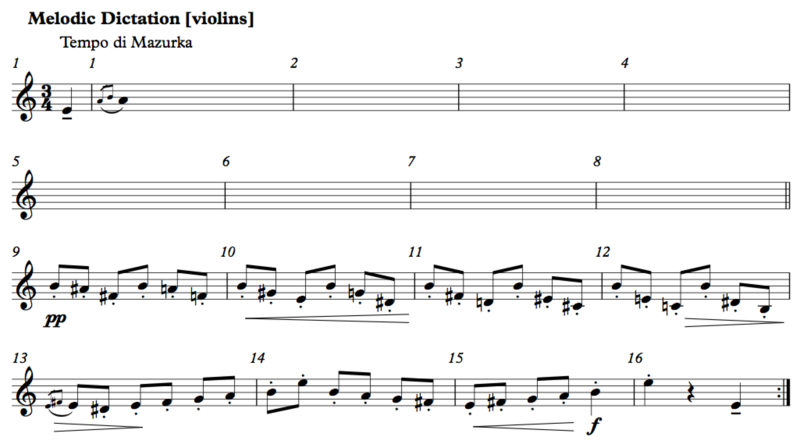 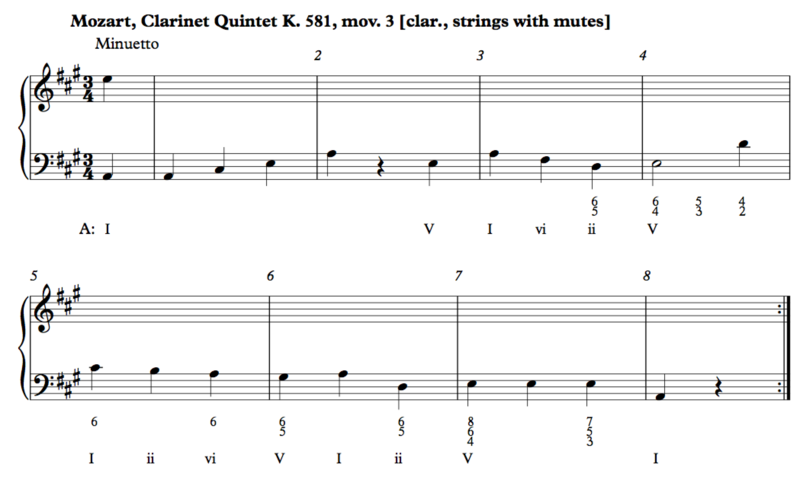 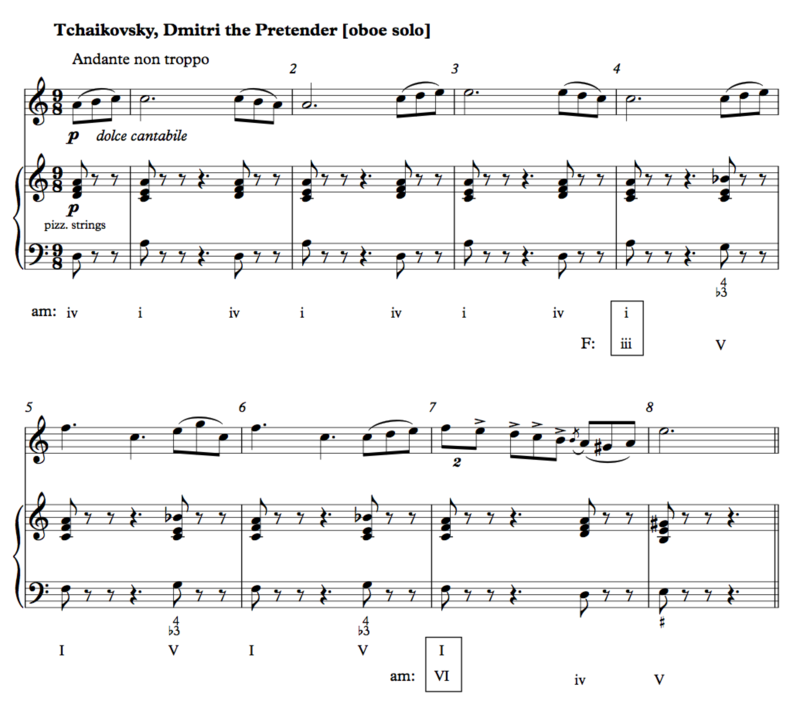 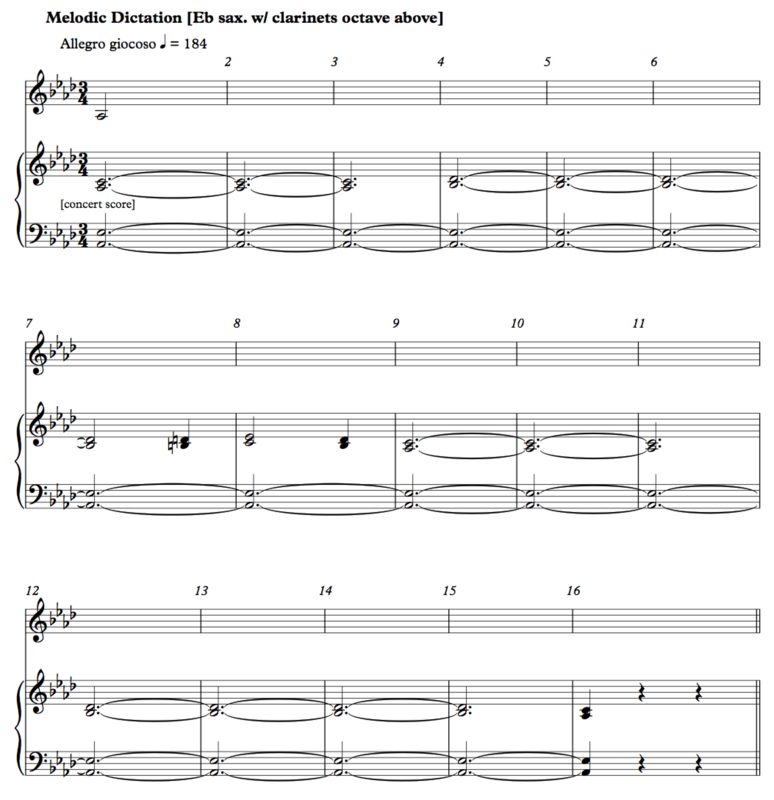 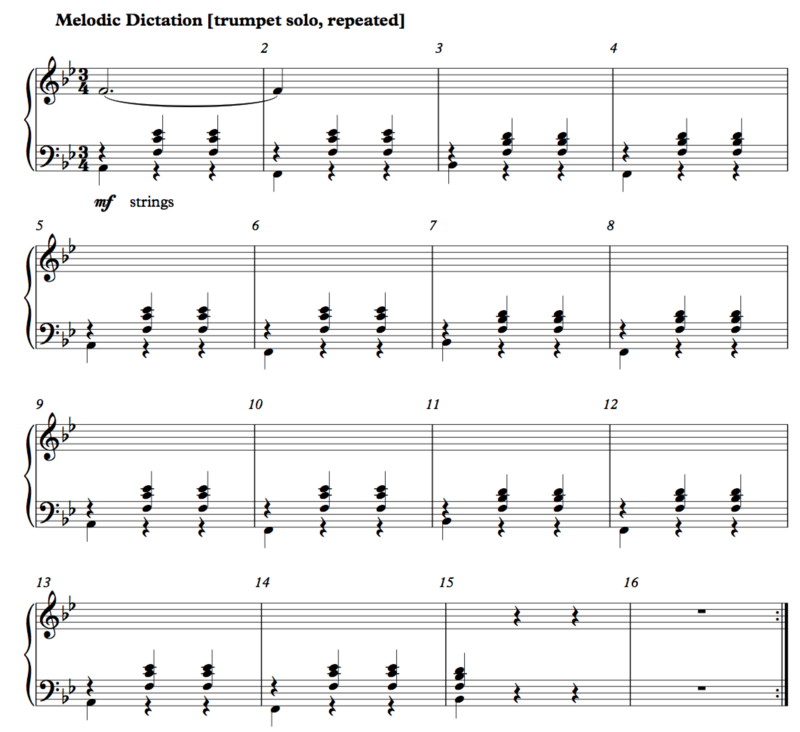 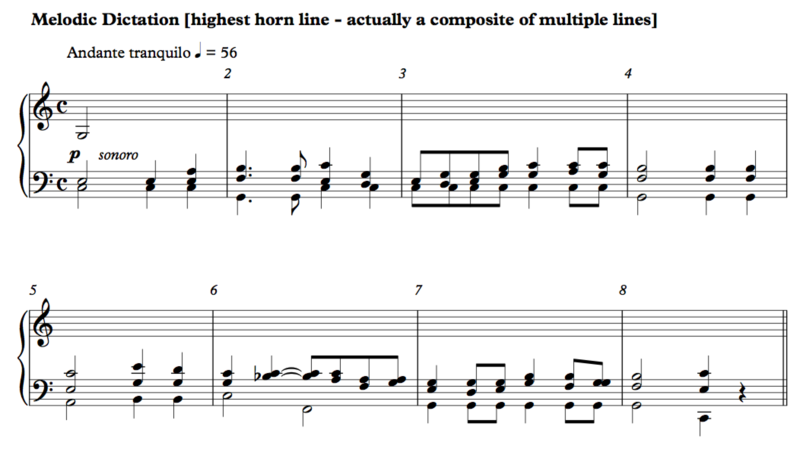 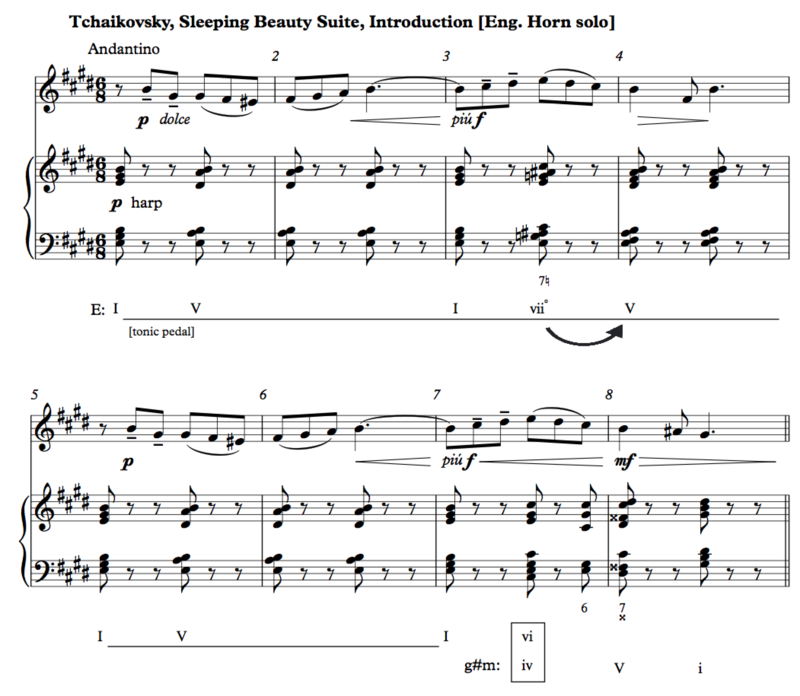 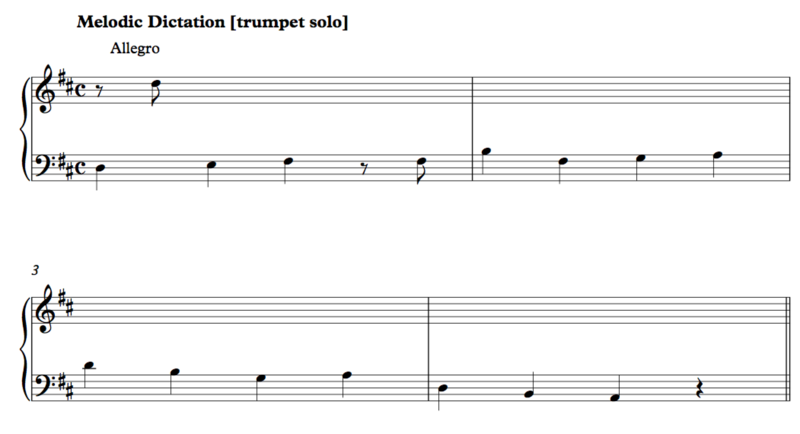 To prevent the possibility of collaboration, students can be required to transcribe a “take-home” melody again in class after a reduced number of hearings. 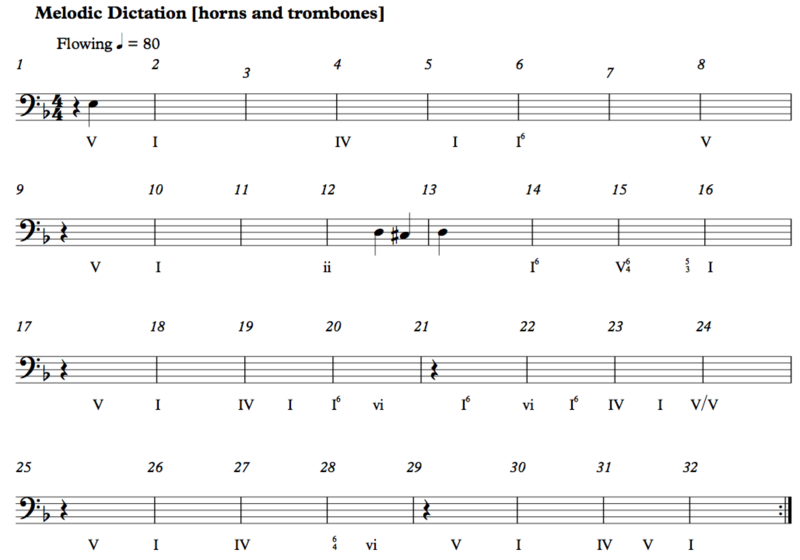 Some excerpts include the possibility for a Roman Numeral analysis. 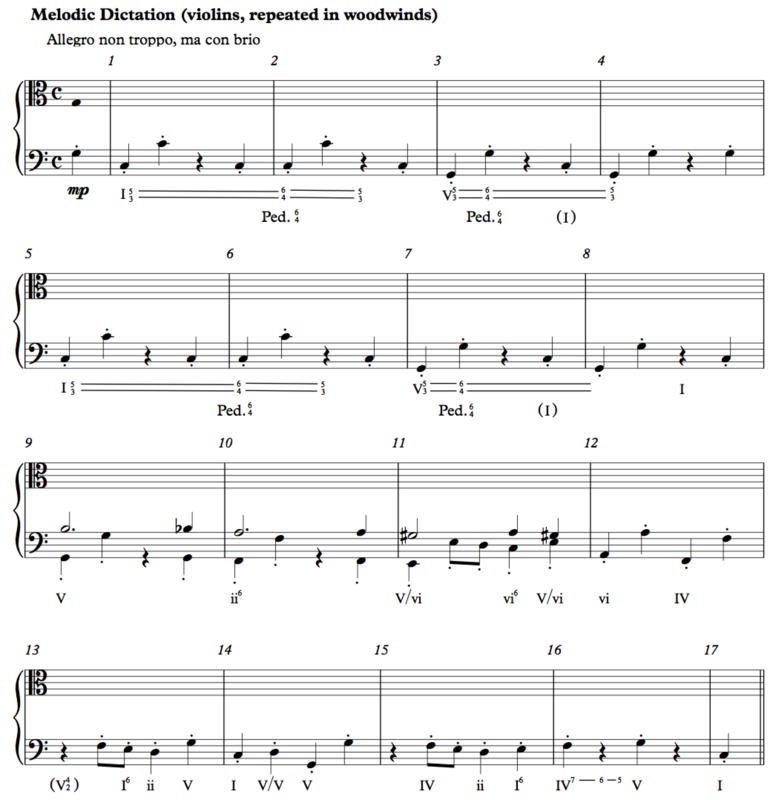 This can be an extension activity after the dictation, especially for those students who finish before their peers. 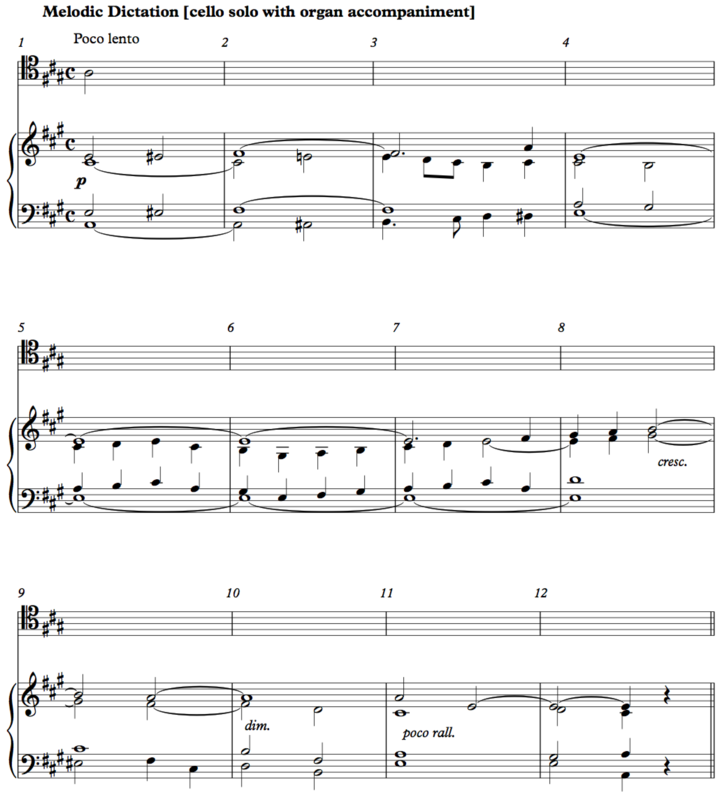 Regarding providing the first pitch, I recommend that the class listen to the excerpt before the blank staves are given out. 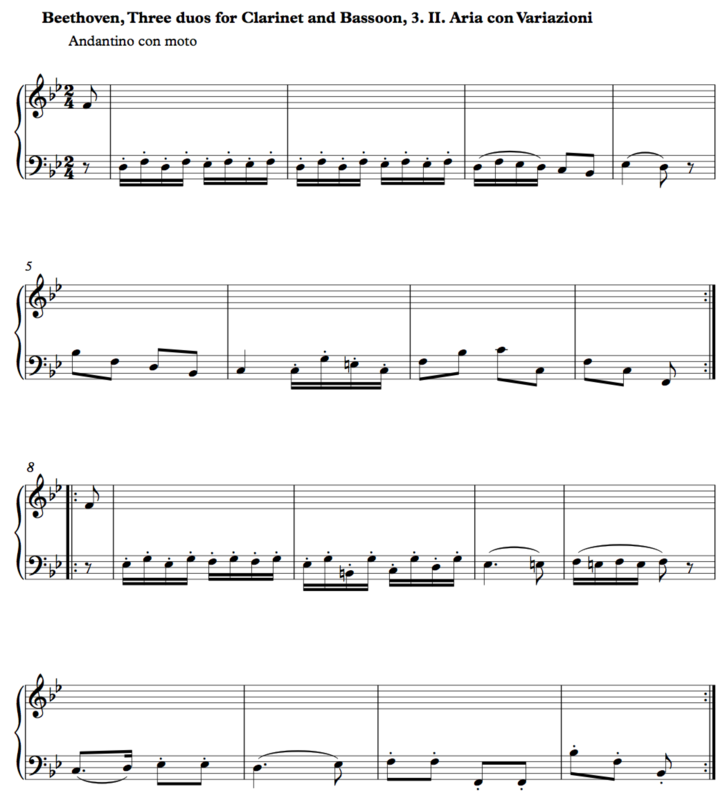 After the class can sing the opening of the melody on a neutral syllable, an individual student should be asked to give the first scale degree. 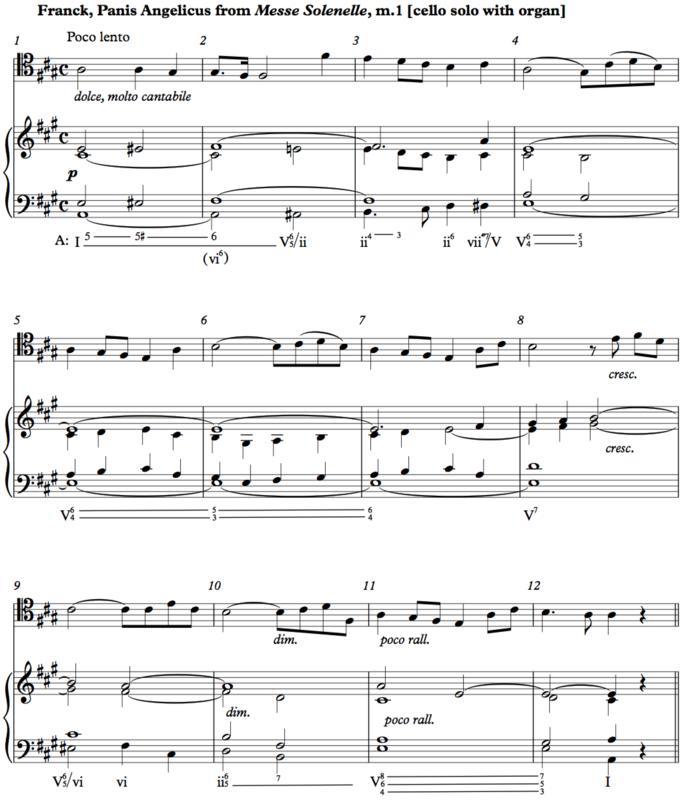 Only then should the instructor distribute the answer blanks. 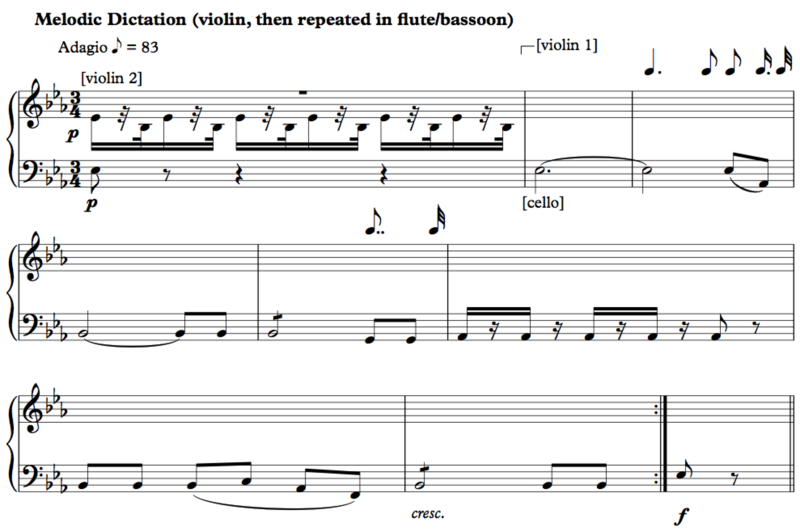 Some melodies may have been placed in other categories. 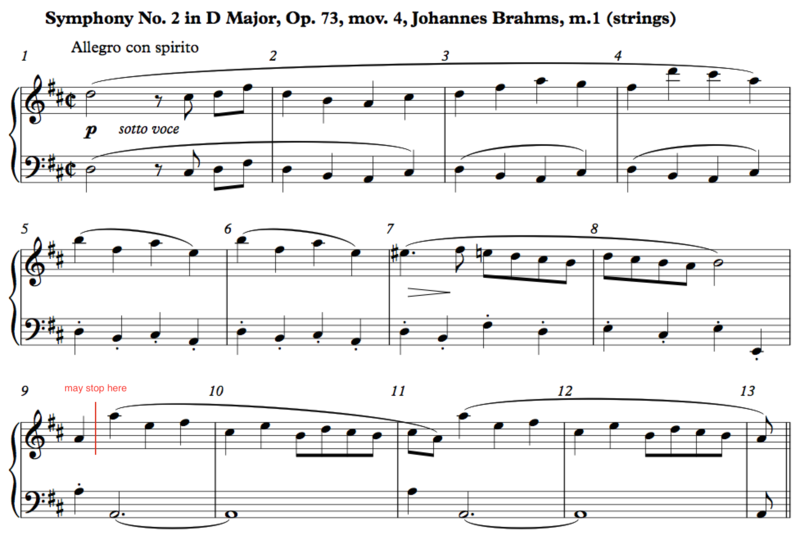 For instance, one question is whether the chromaticism is in the melody or the accompaniment. 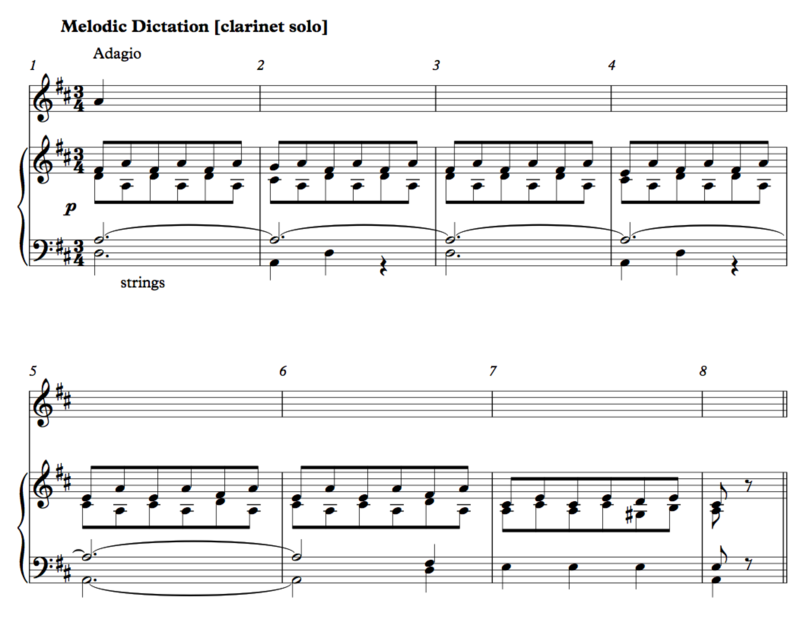 In general, if the melody was diatonic, I placed it in a diatonic category, unless the chromaticism in the accompaniment was very prevalent. 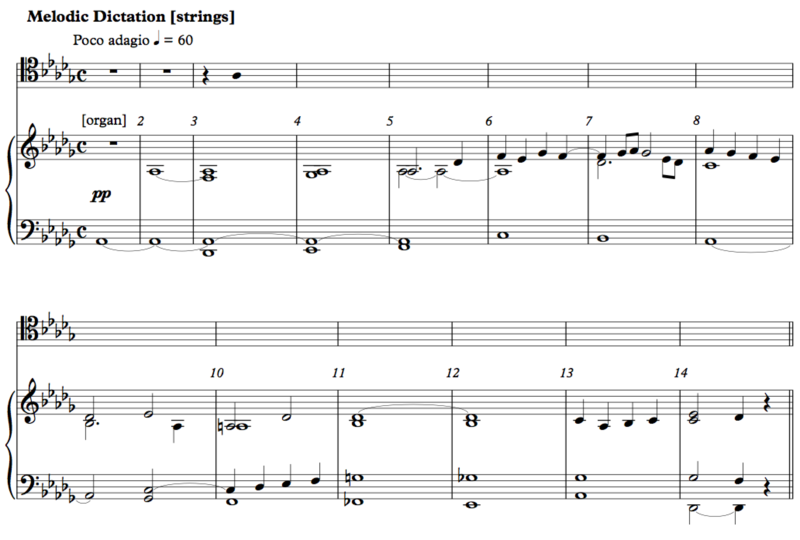 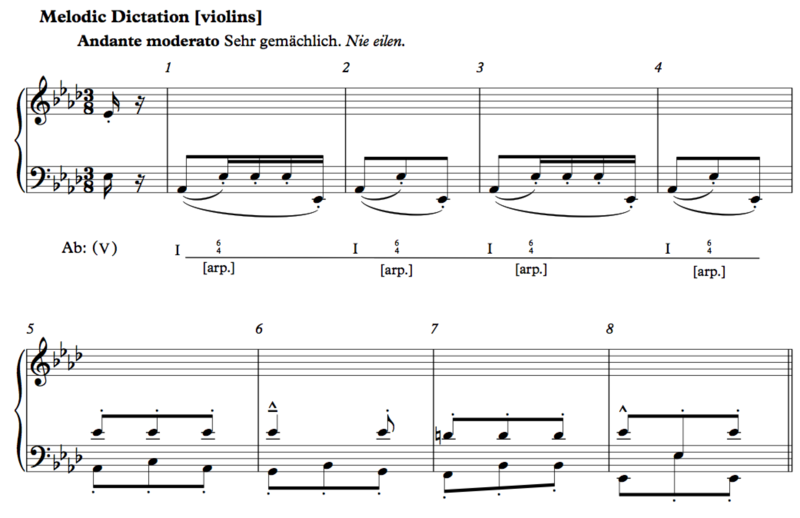 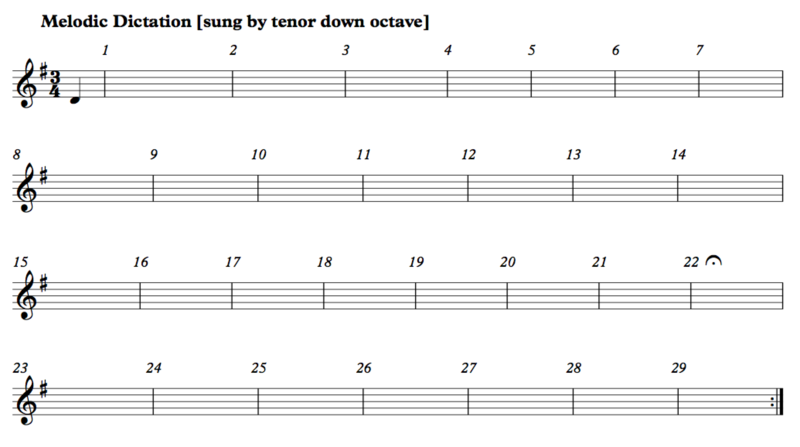 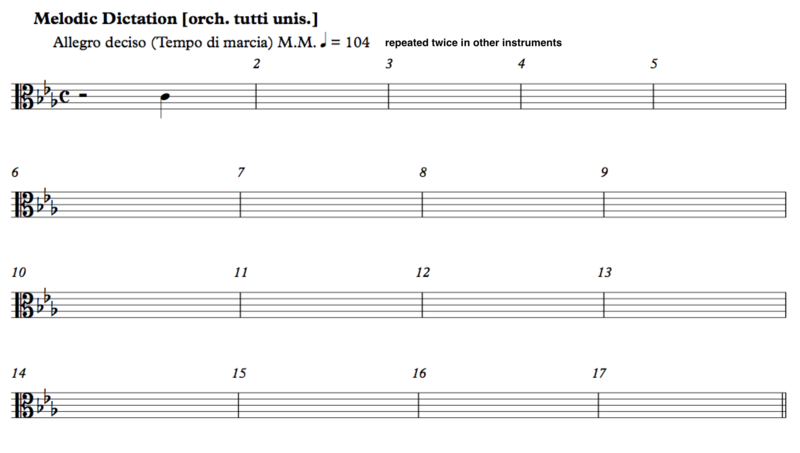 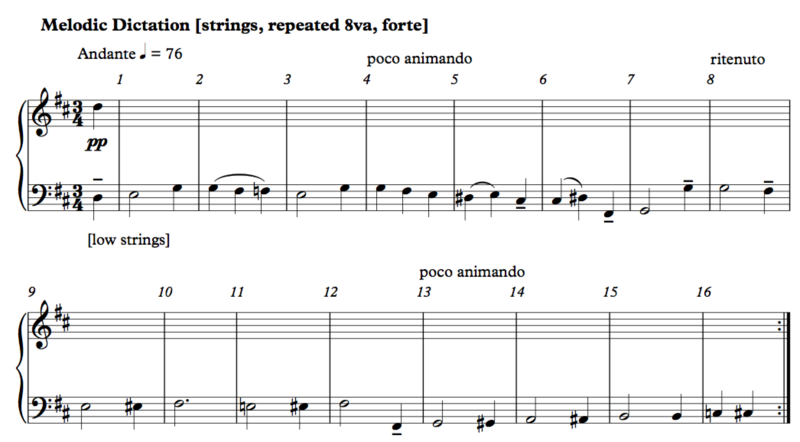 Long melodies with internal repetitions were categorized as “medium” in length. 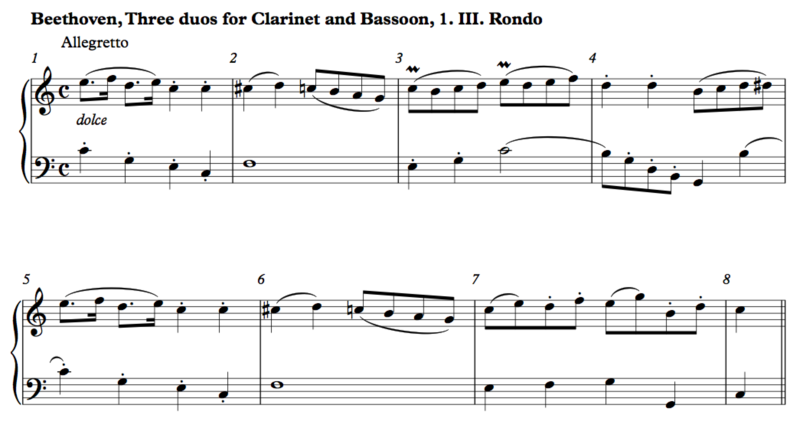 As a reminder, teachers may choose to do only a portion of the longer excerpts if they are found to be too difficult. 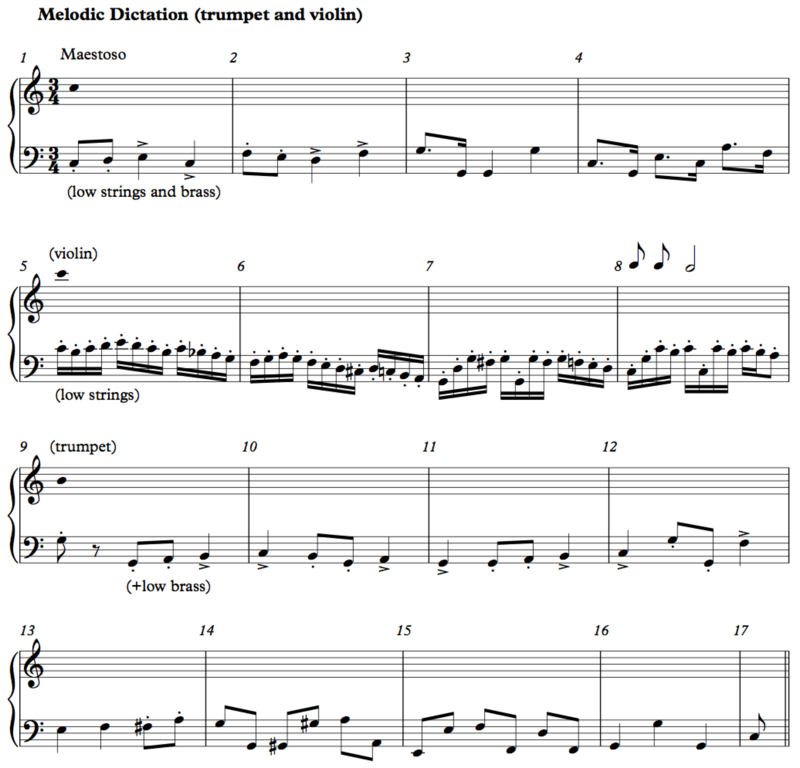 On occasion, multiple options are provided for the student–some provide an accompaniment and some a harmonic analysis. 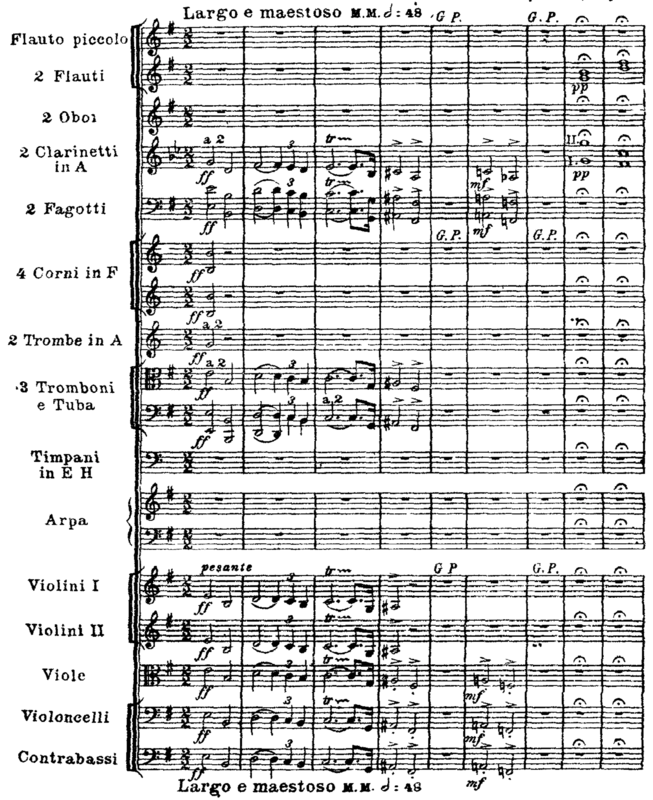 Original markings are included in the answer score. 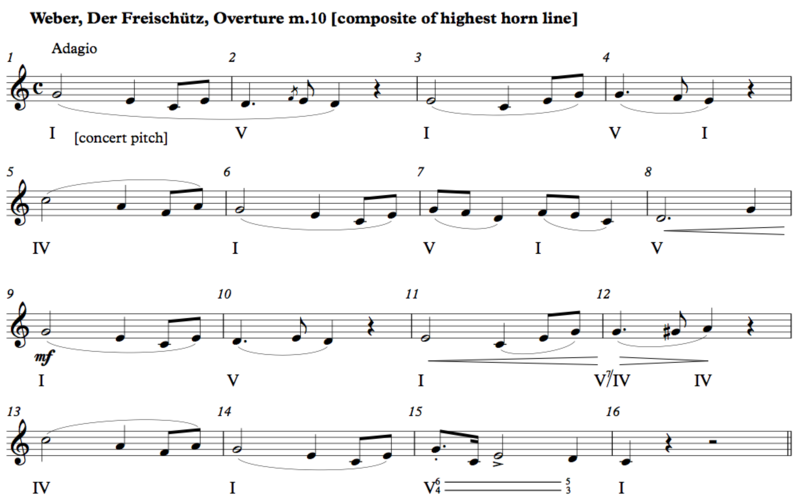 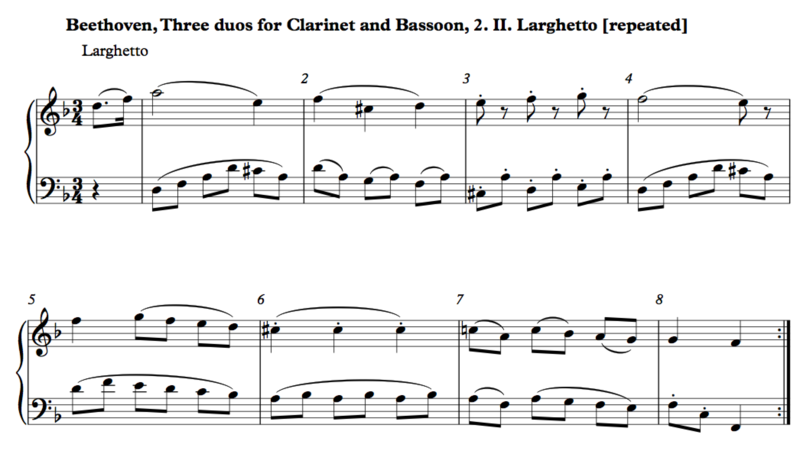 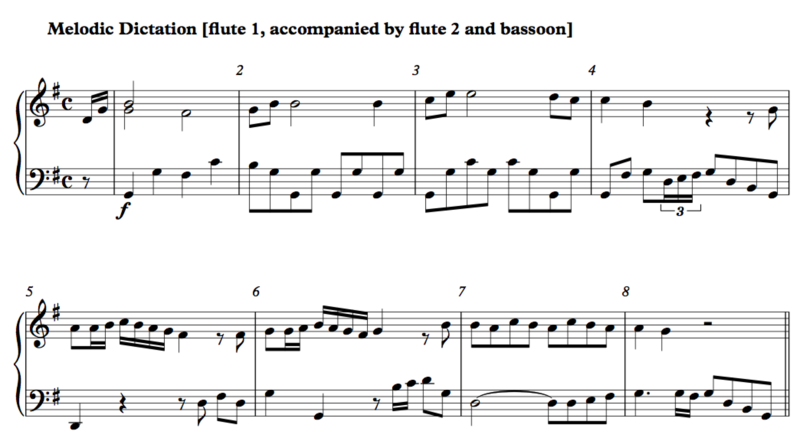 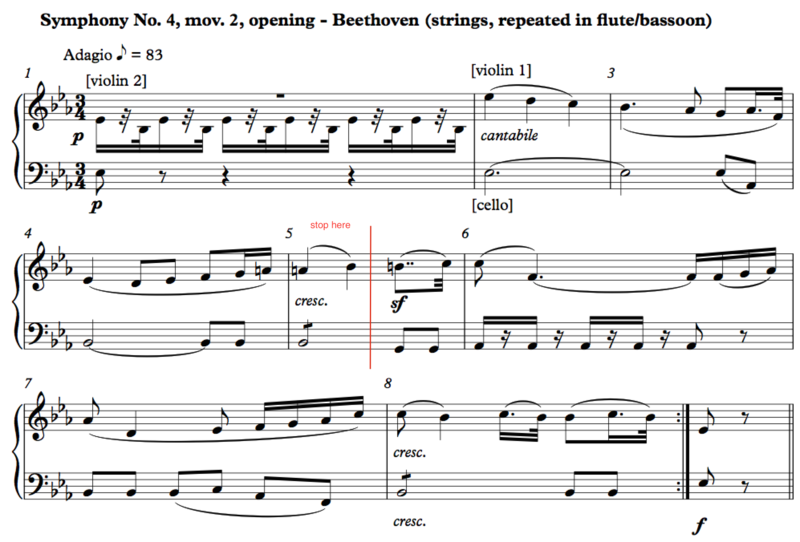 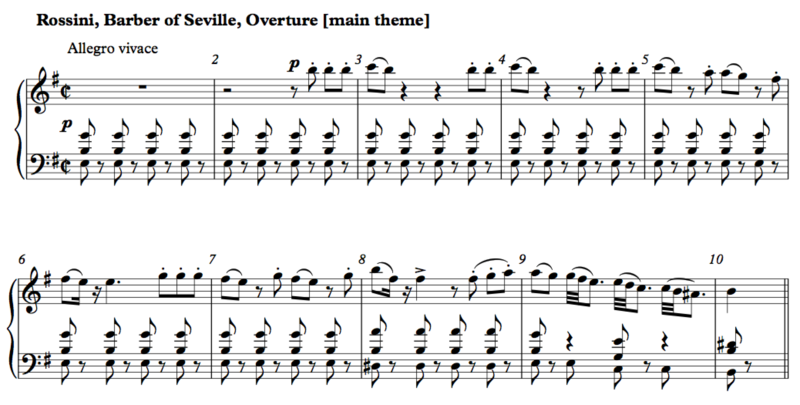 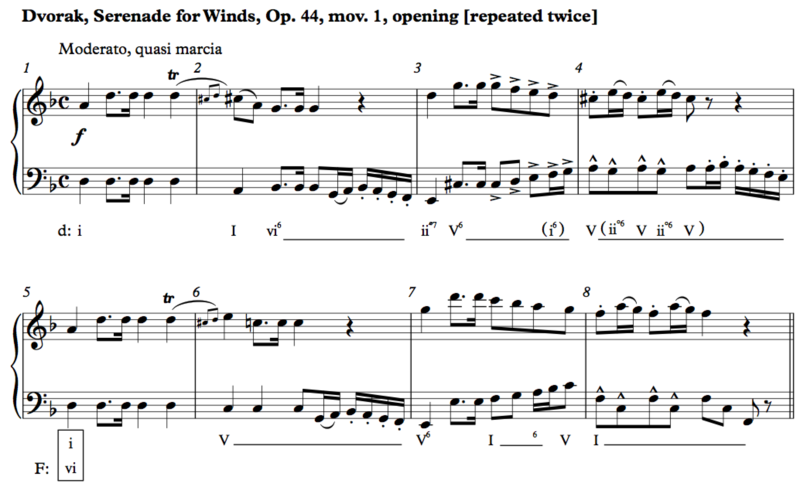 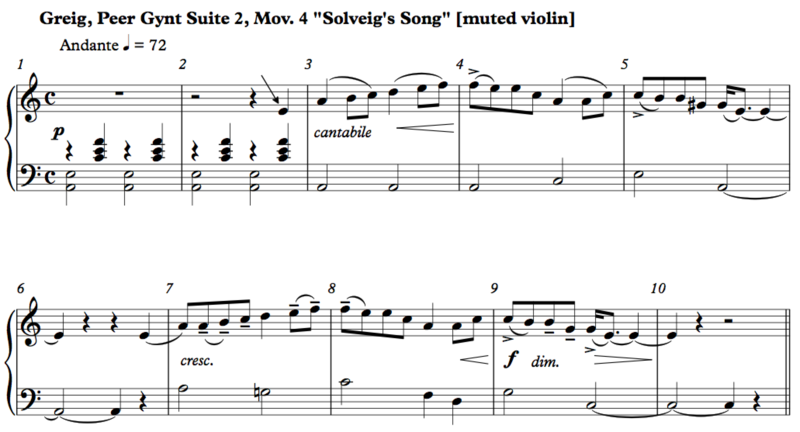 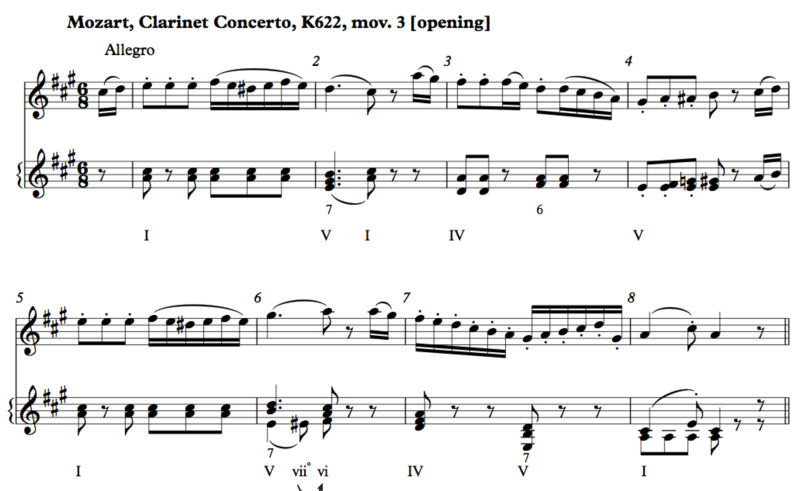 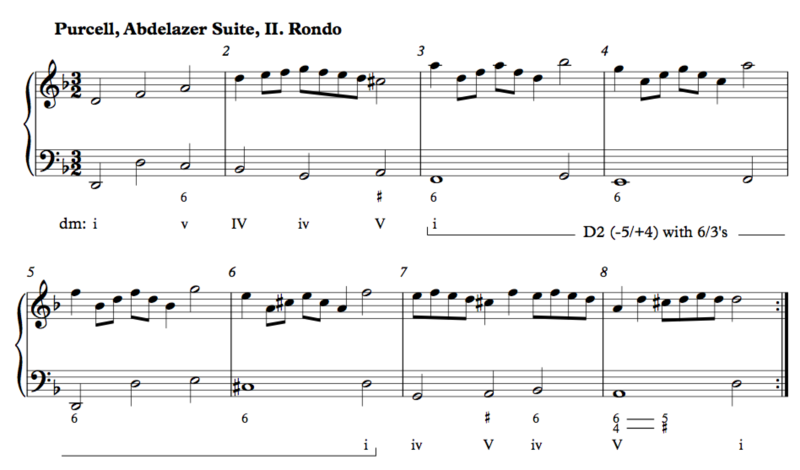 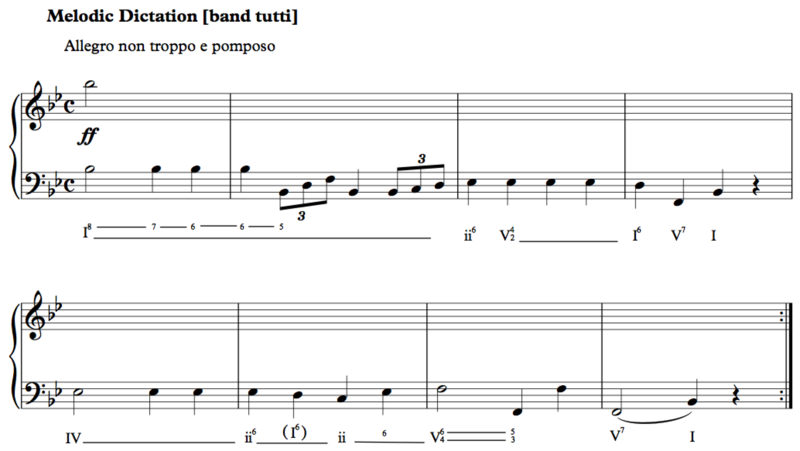 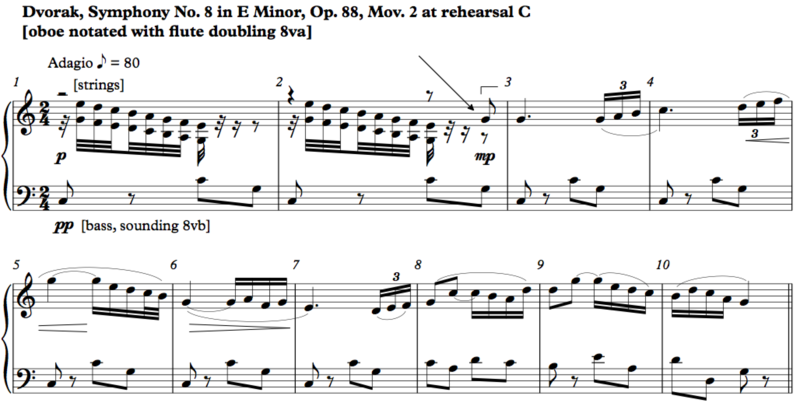 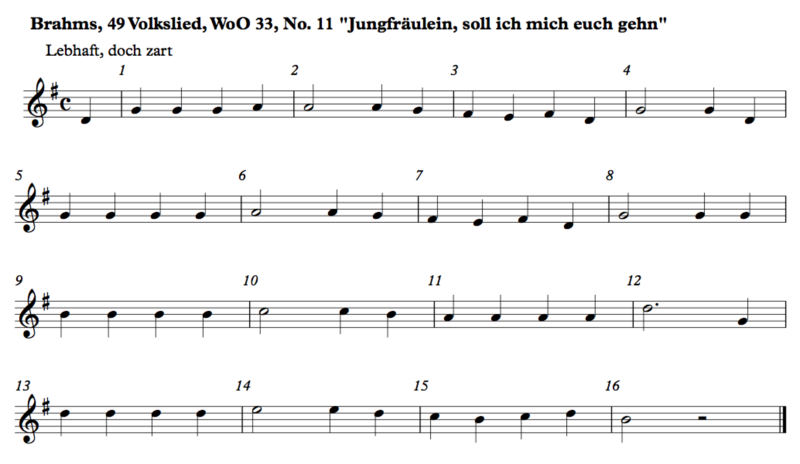 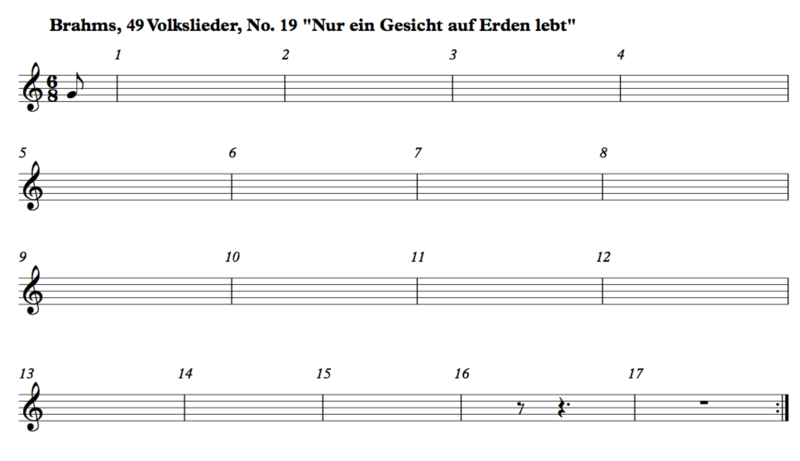 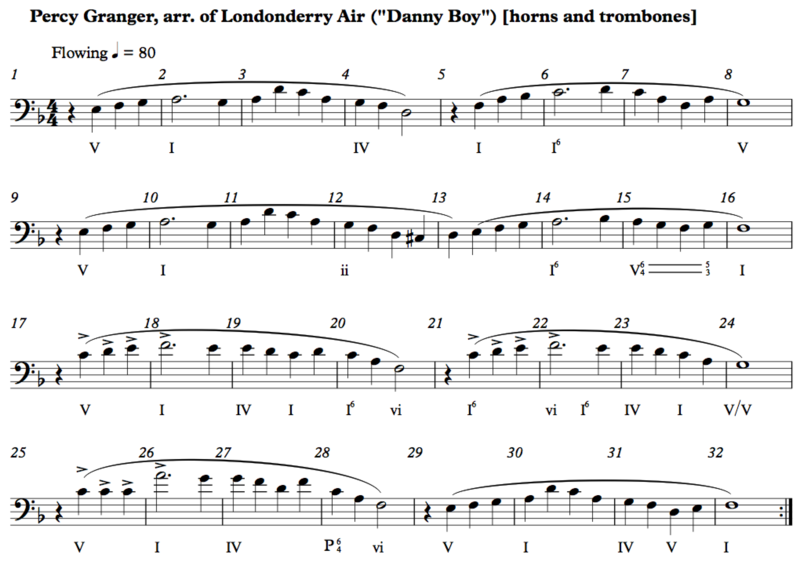 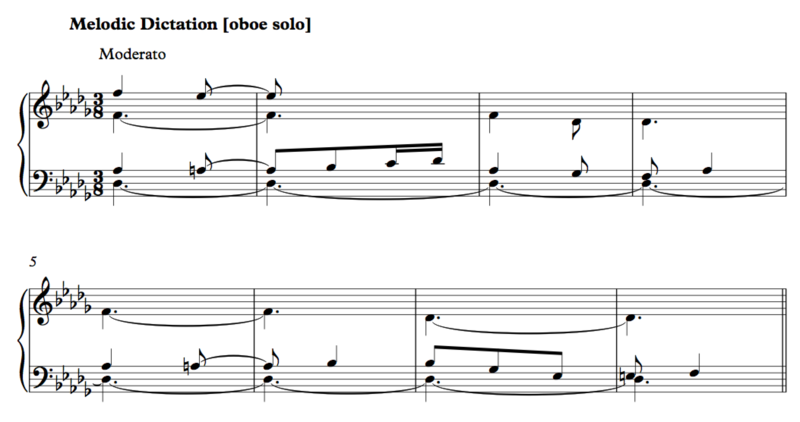 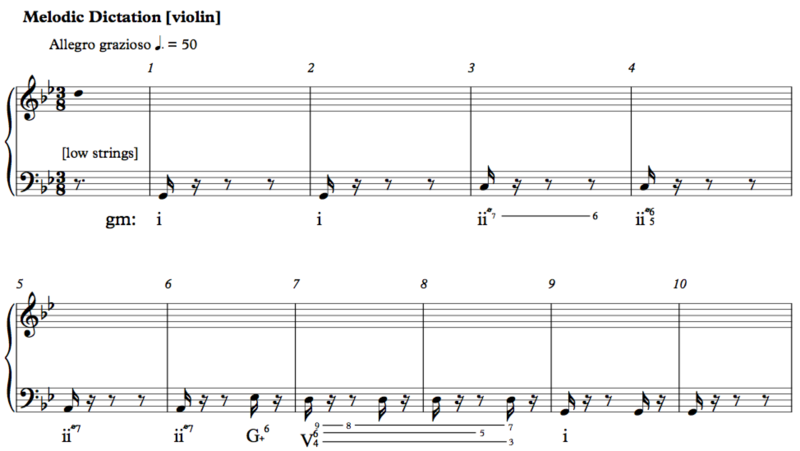 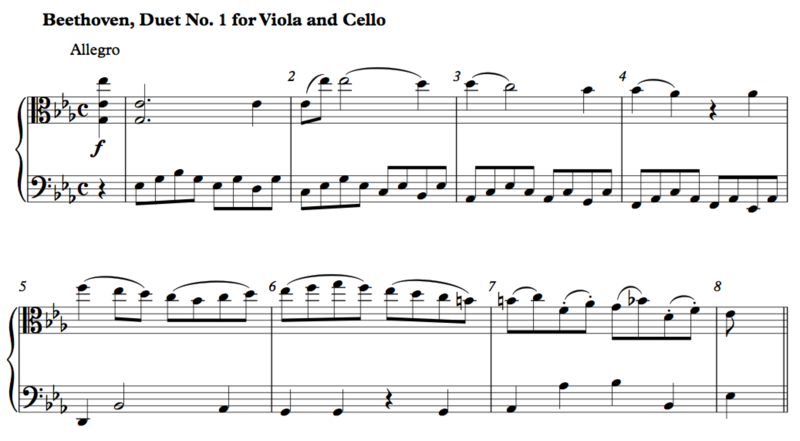 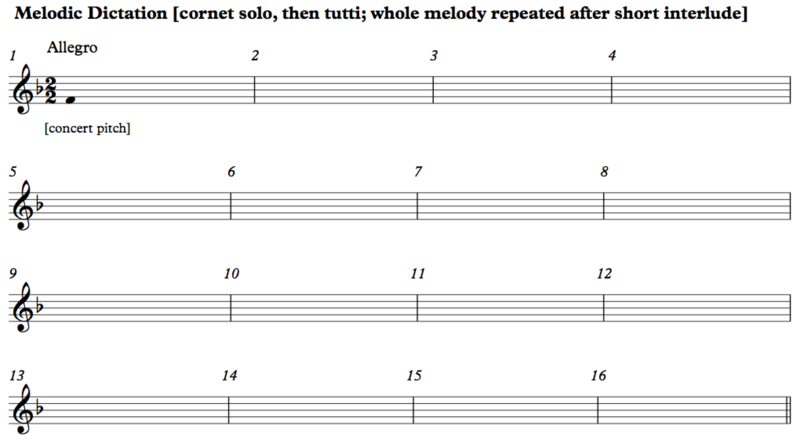 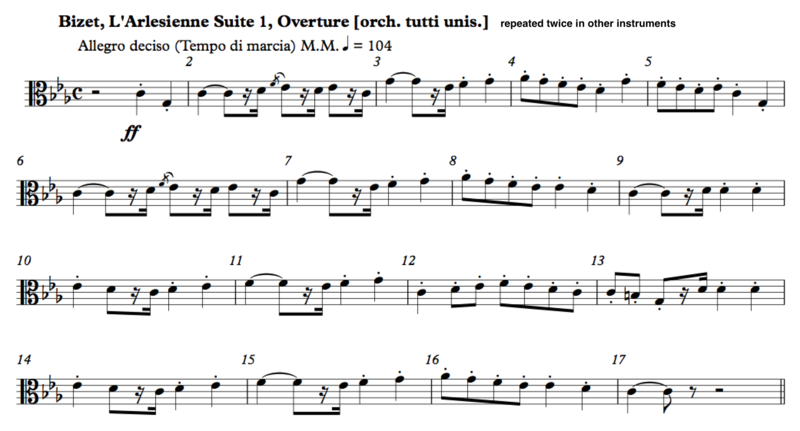 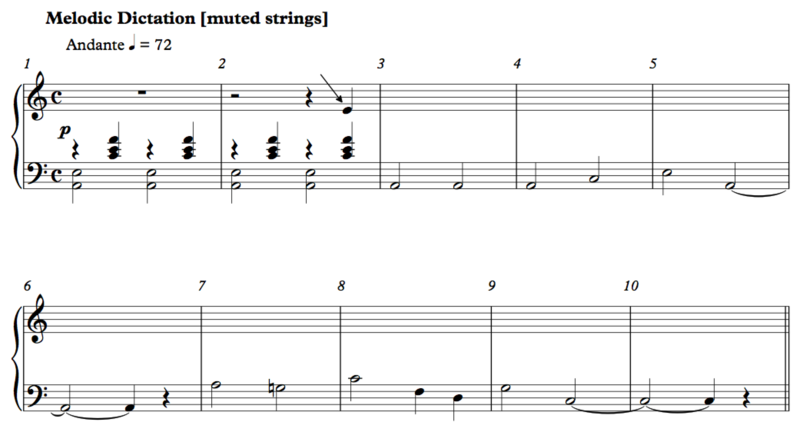 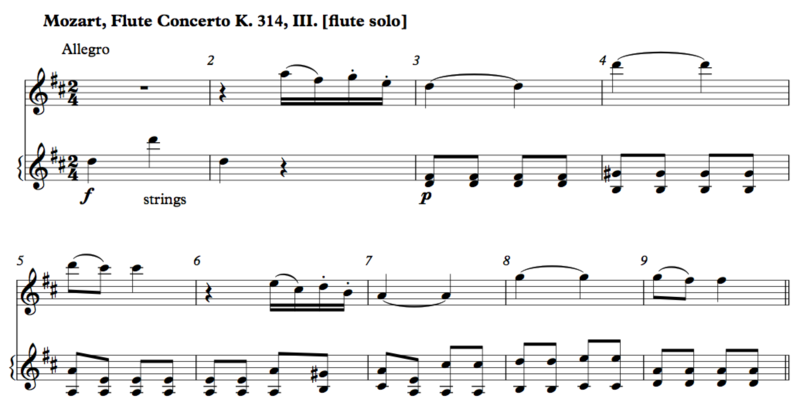 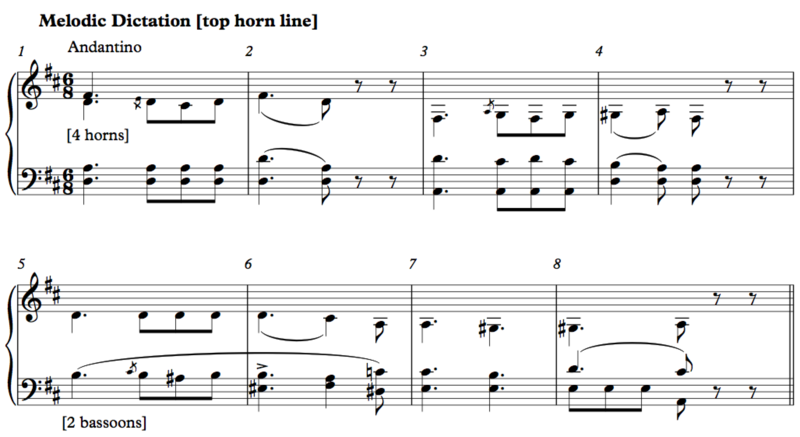 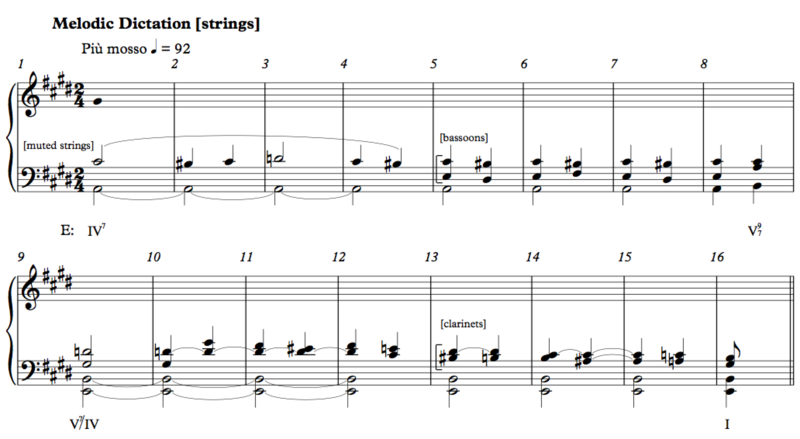 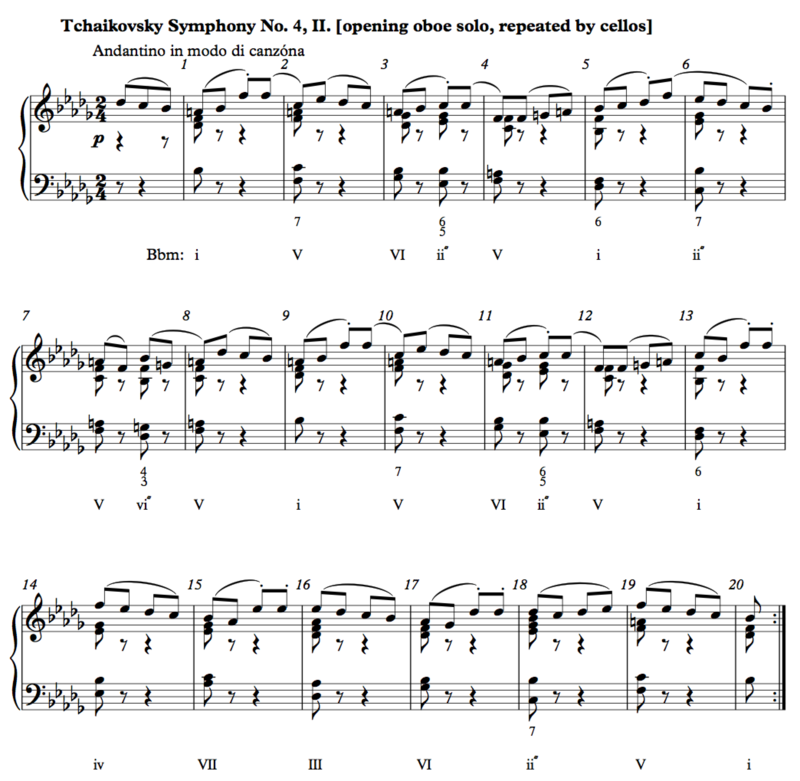 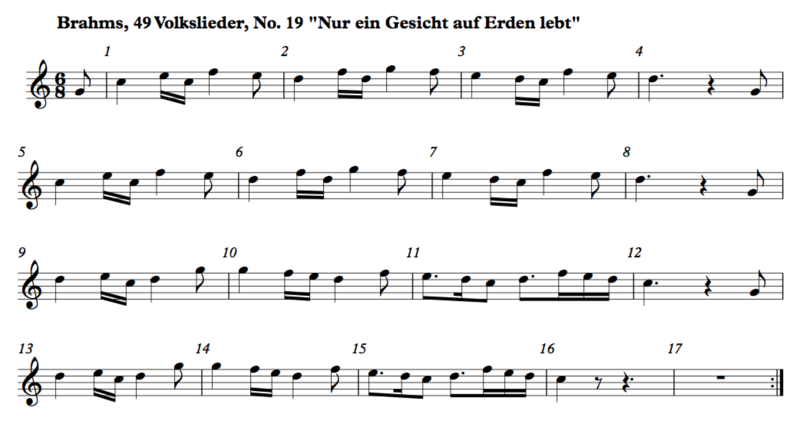 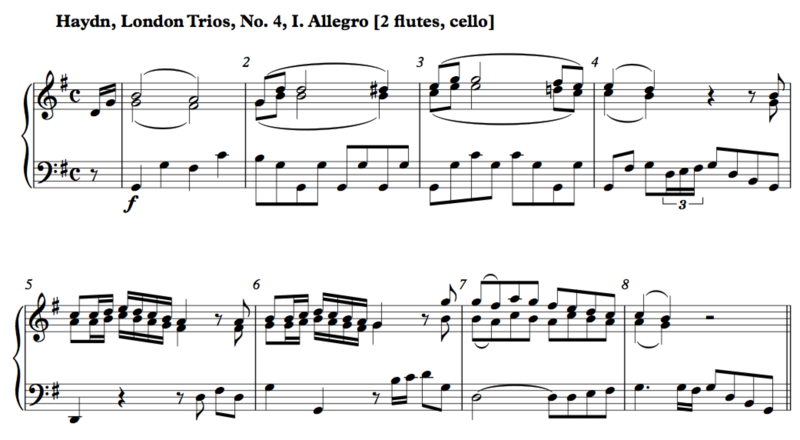 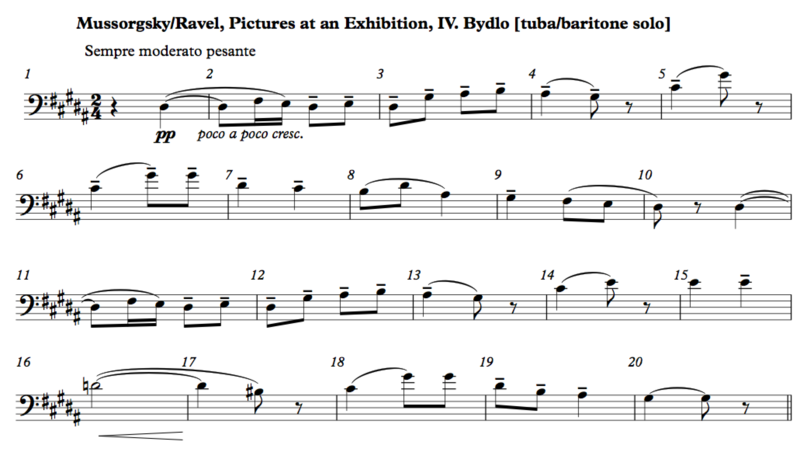 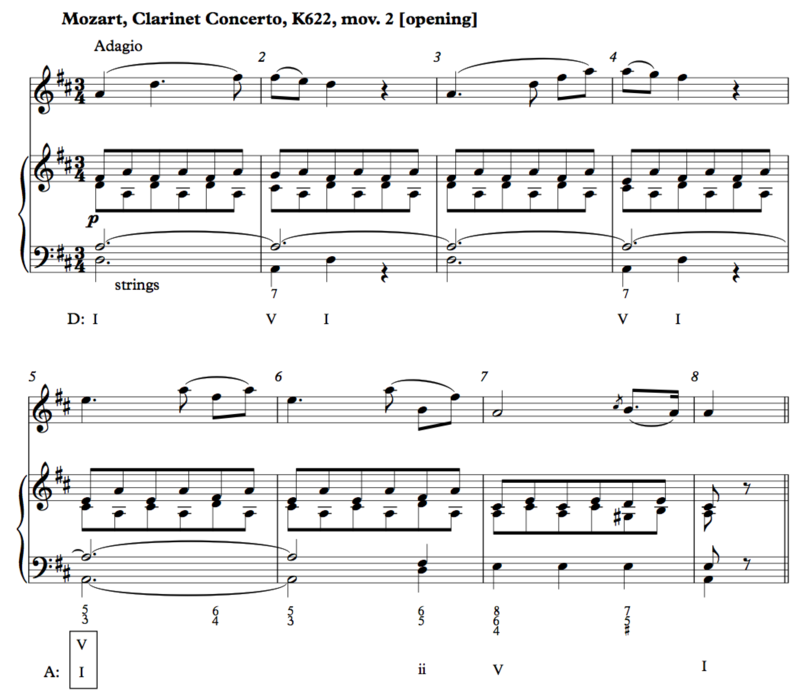 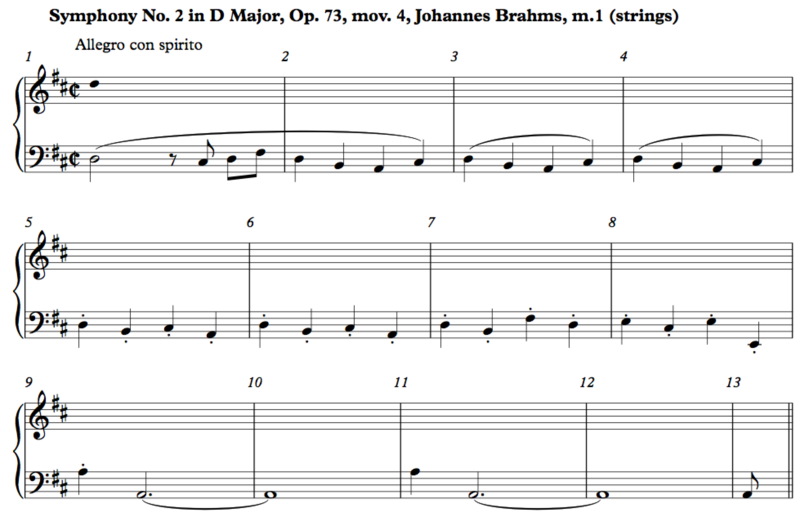 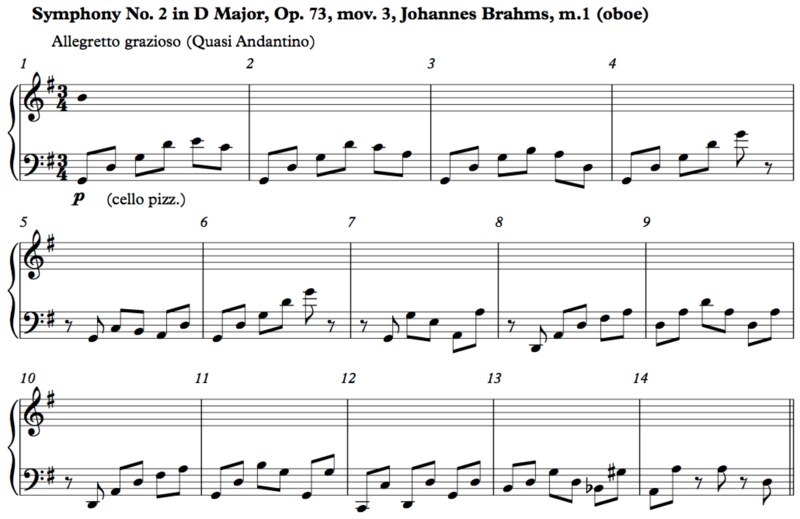 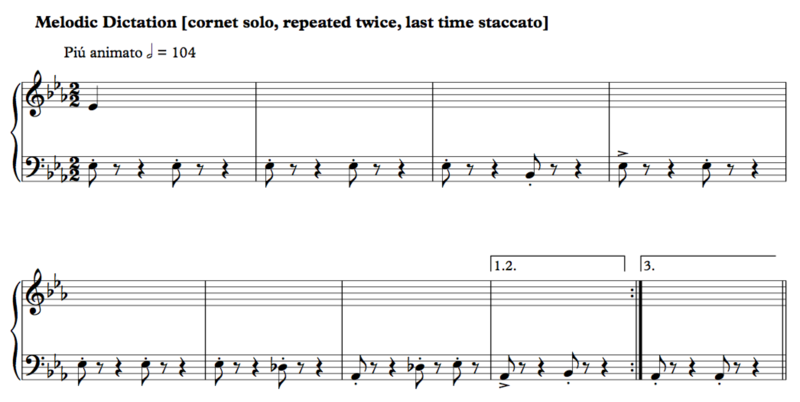 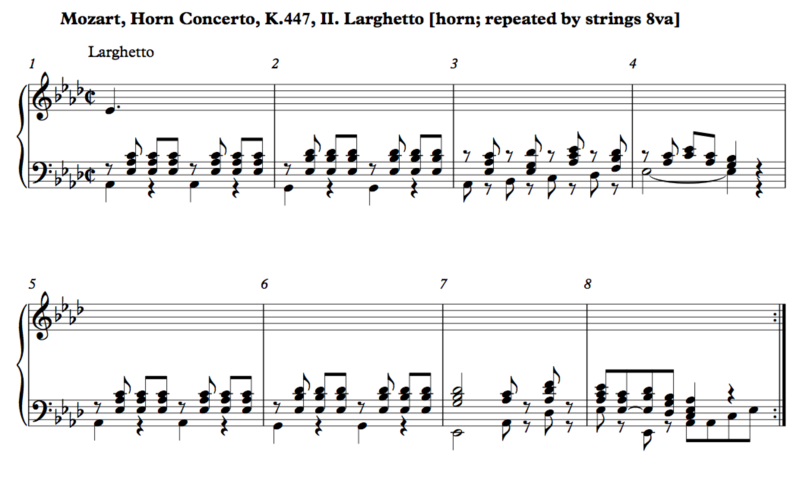 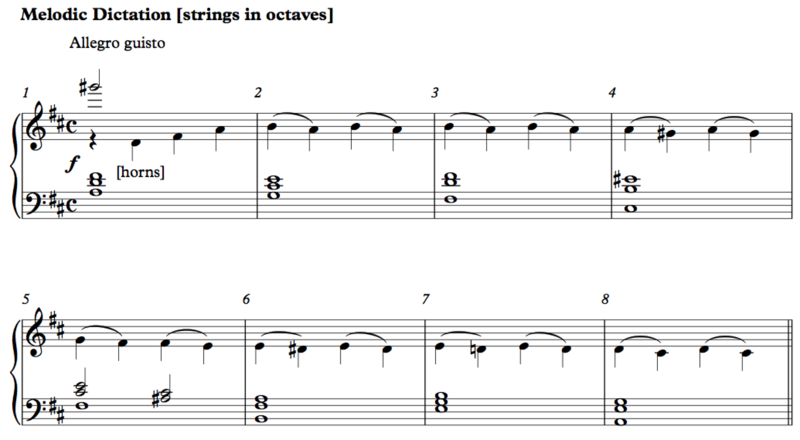 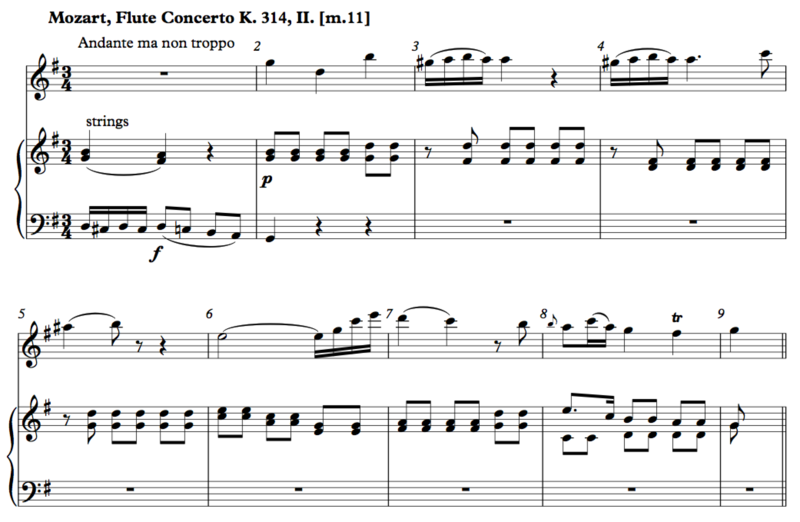 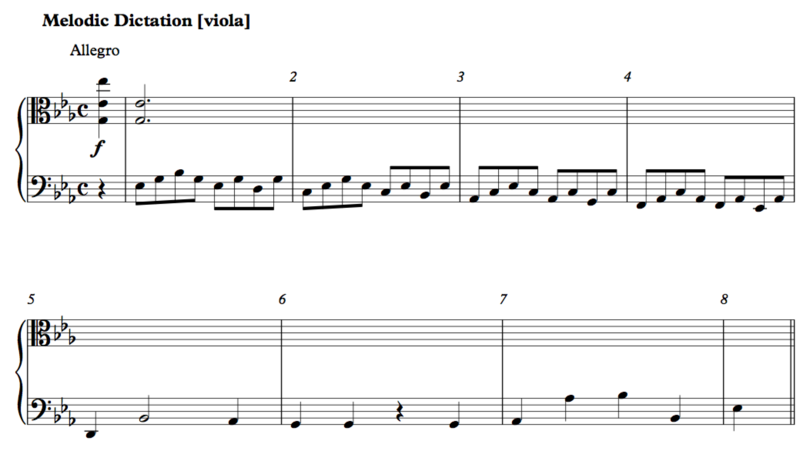 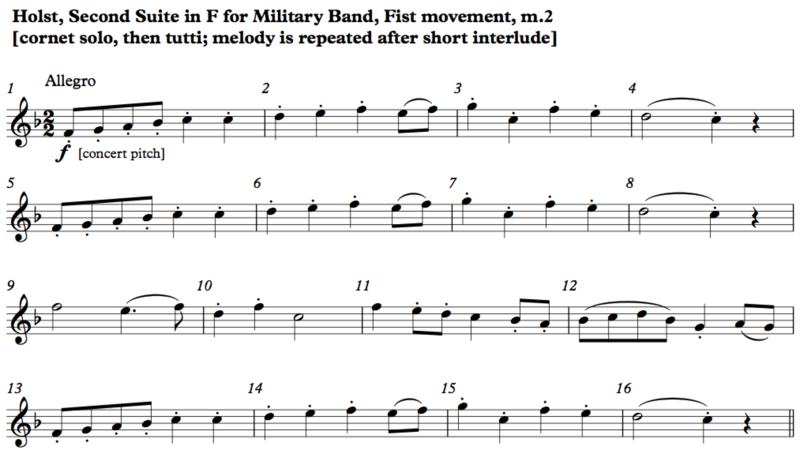 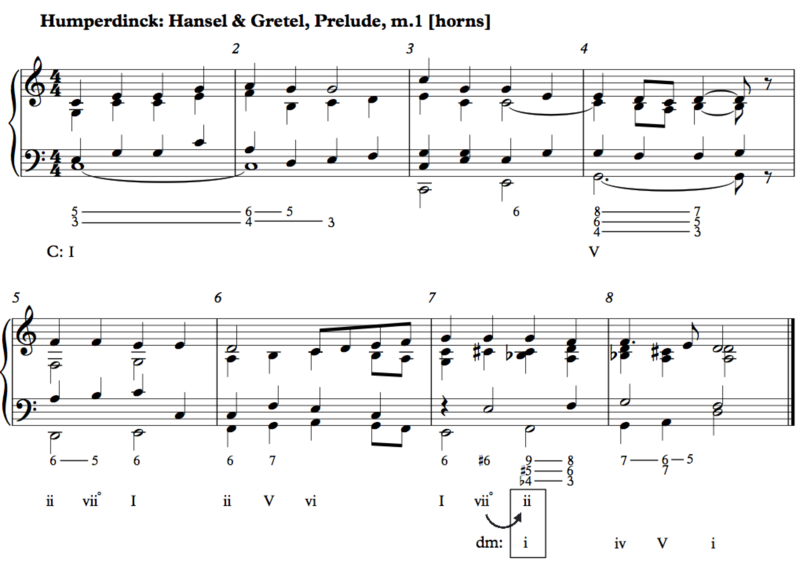 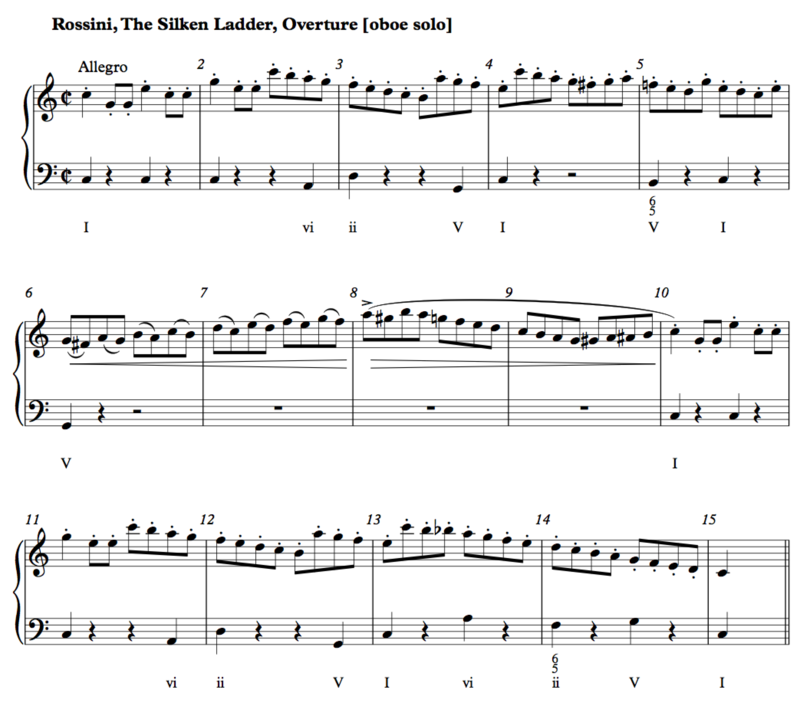 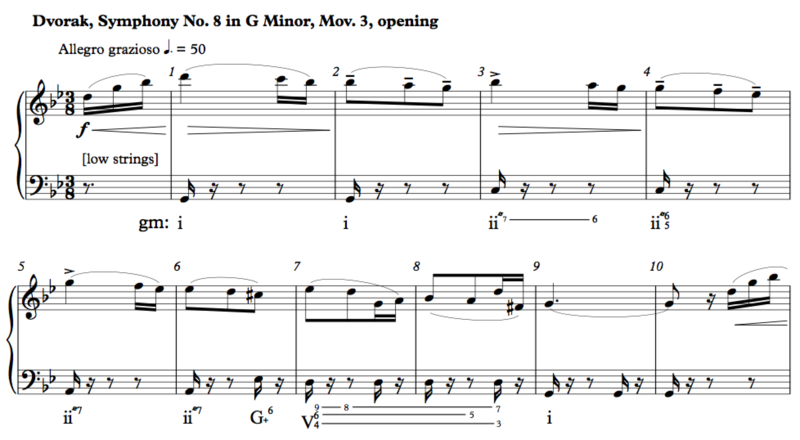 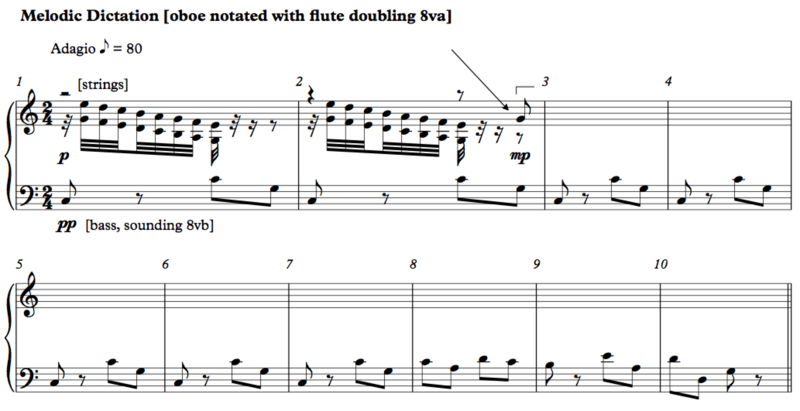 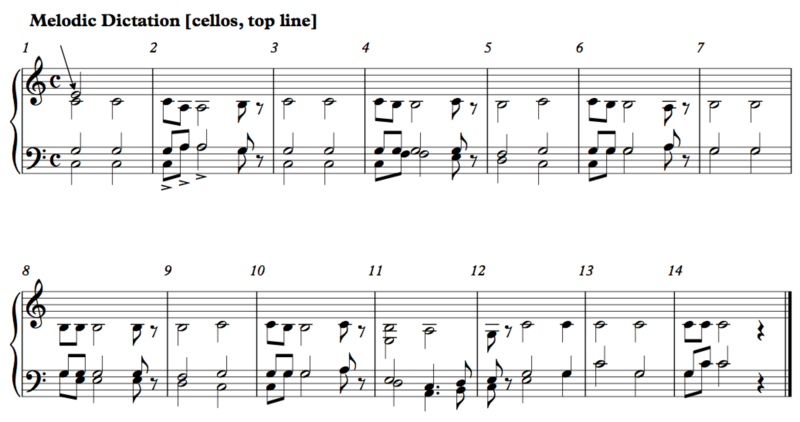 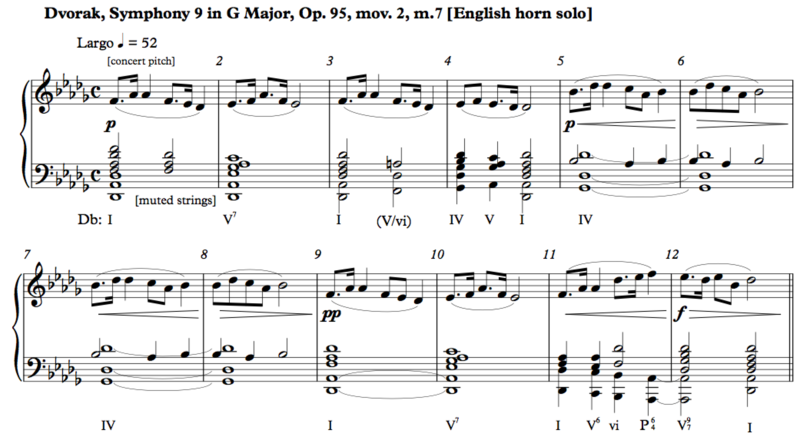 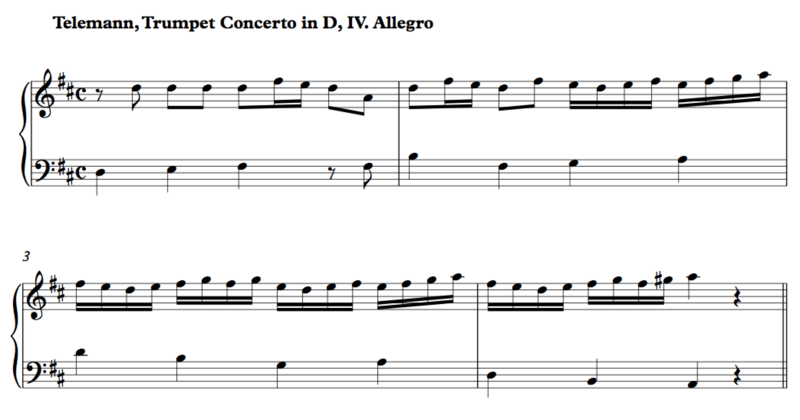 All bar numbers begin with “1,” even if the excerpt is taken from the middle of a piece. 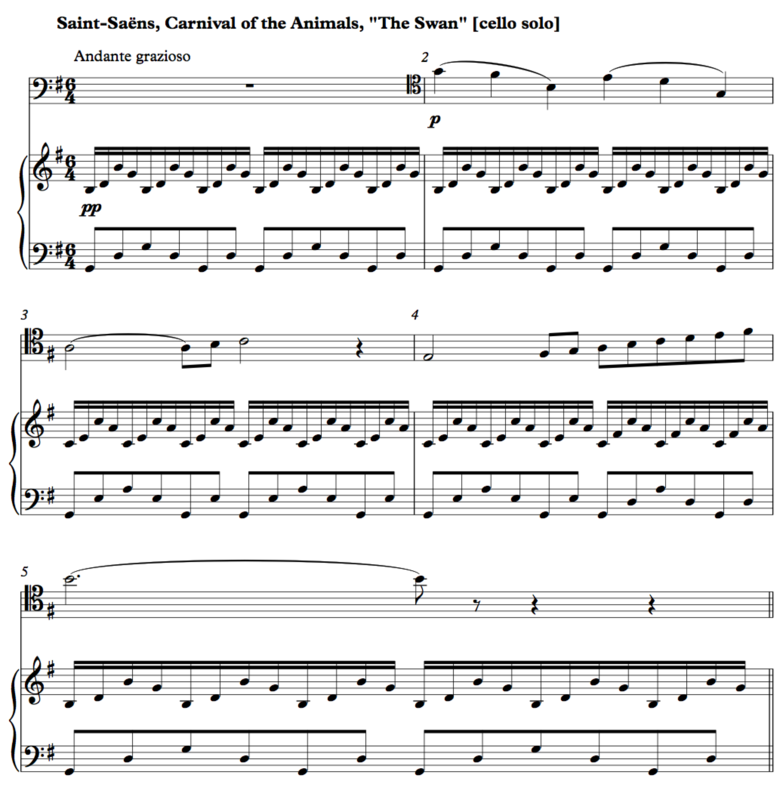 Please email me at the address on the right sidebar if you find any links that don’t work. 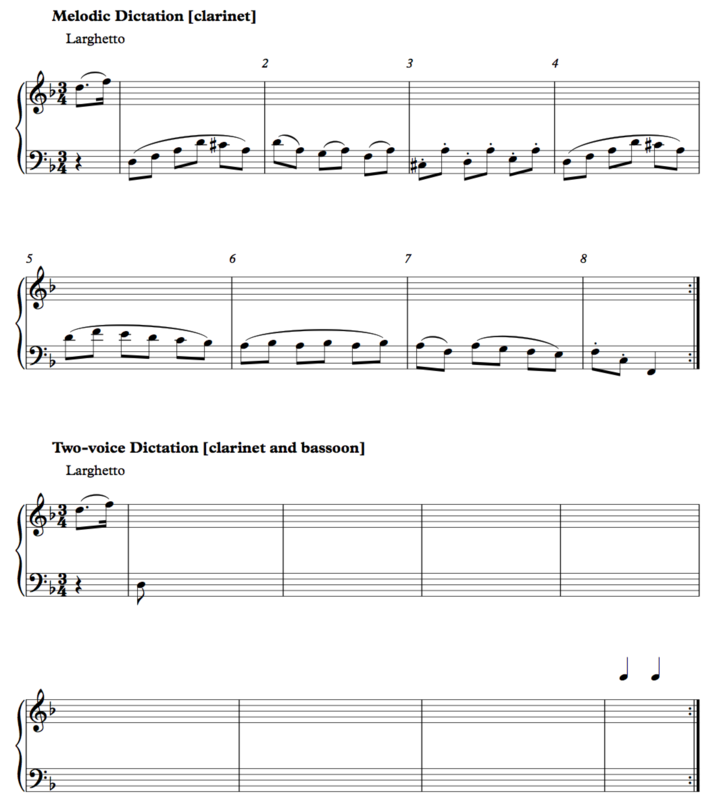 Thank you for your help, and I hope this collection proves useful. 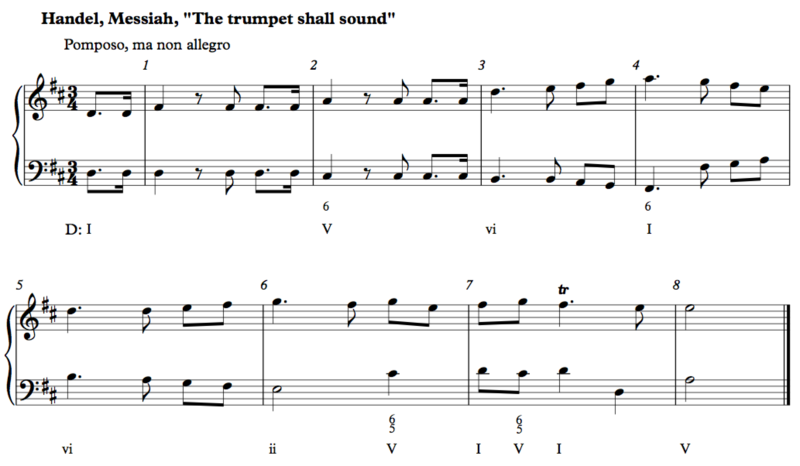 A vocal warm up in the key of the exercise helps orient students aurally and improves success. 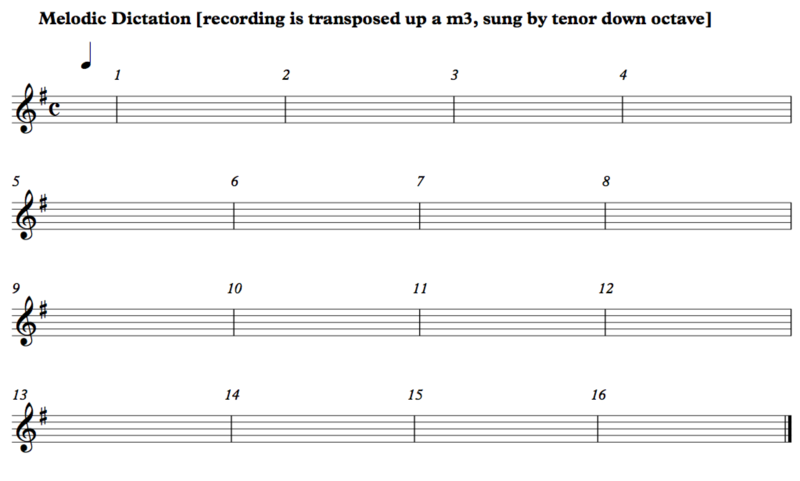 (Beware that some of the recordings are at different pitch levels.) 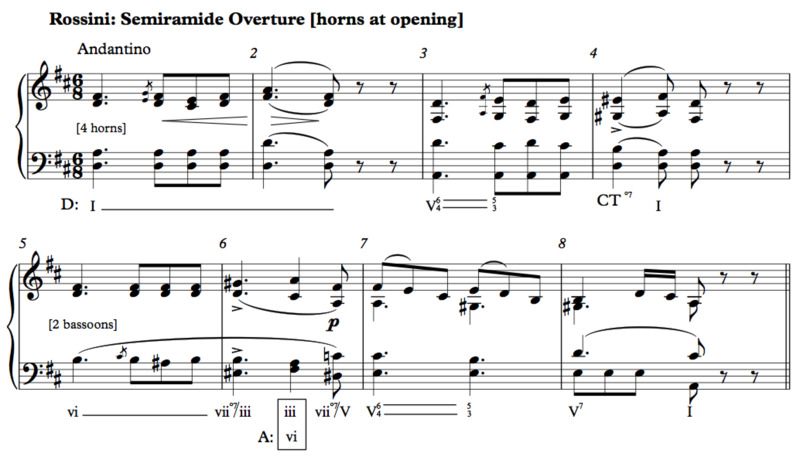 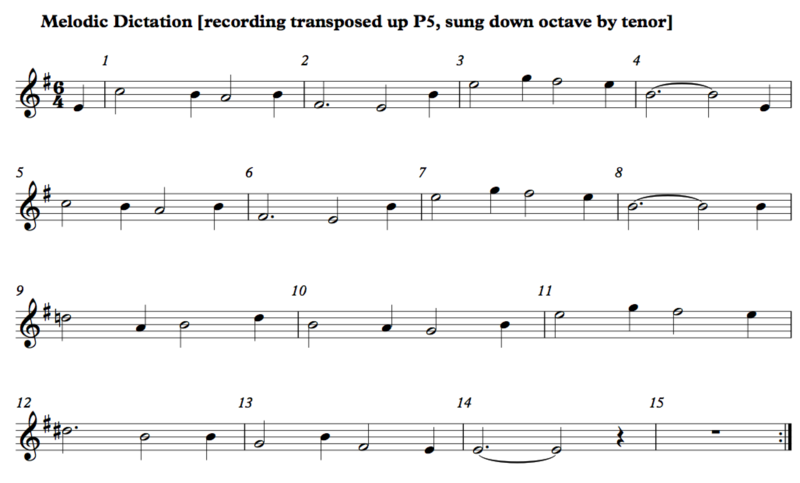 Transpose any phrase by octave as needed based on the range. 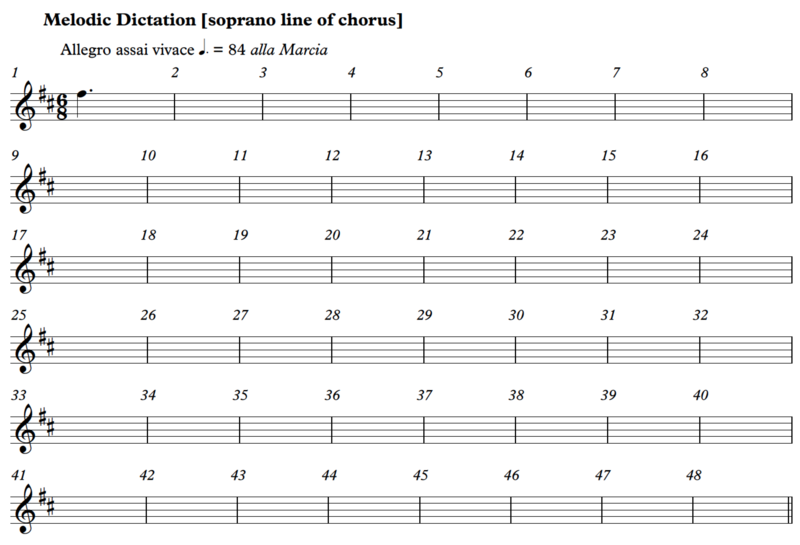 Sing on scale degrees, fixed-do solfège, or neutral syllable. 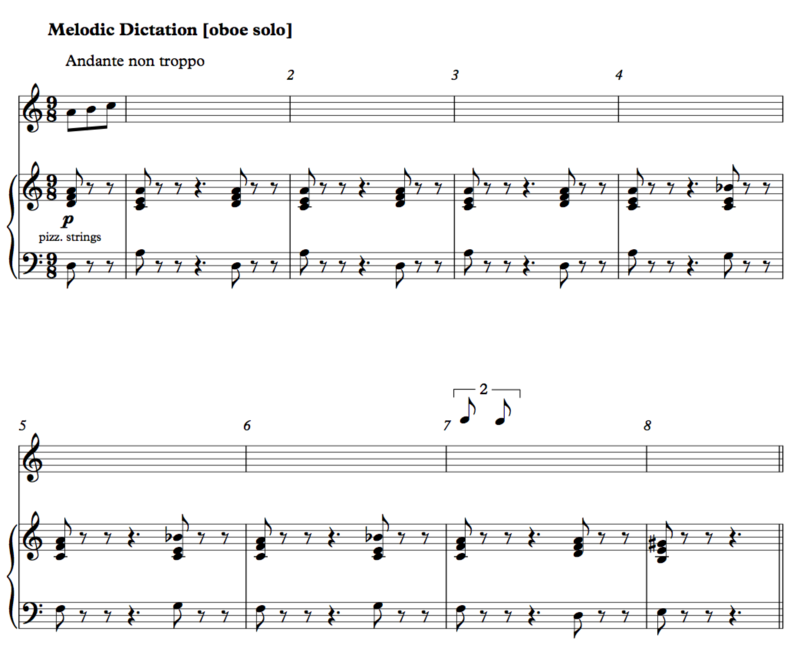 These well-known tunes are useful introductions into dictation. 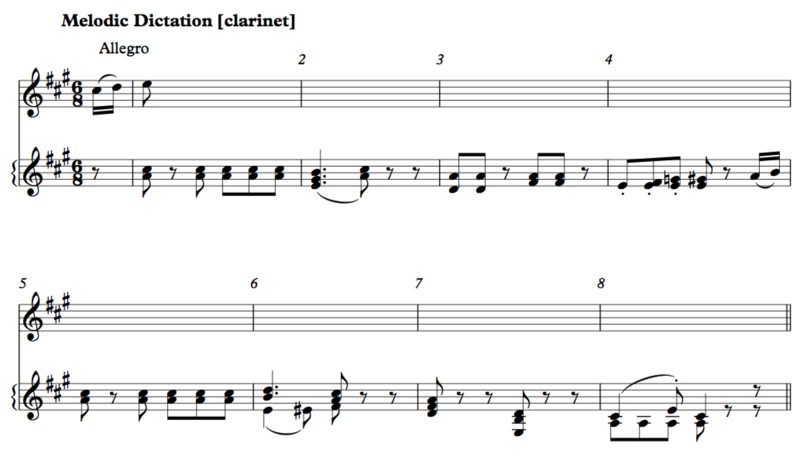 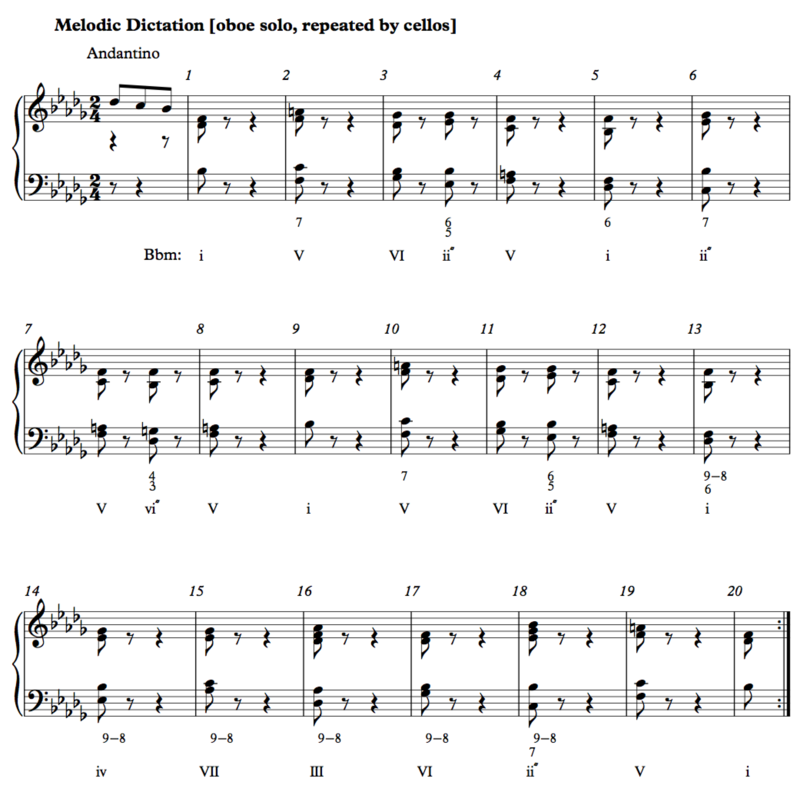 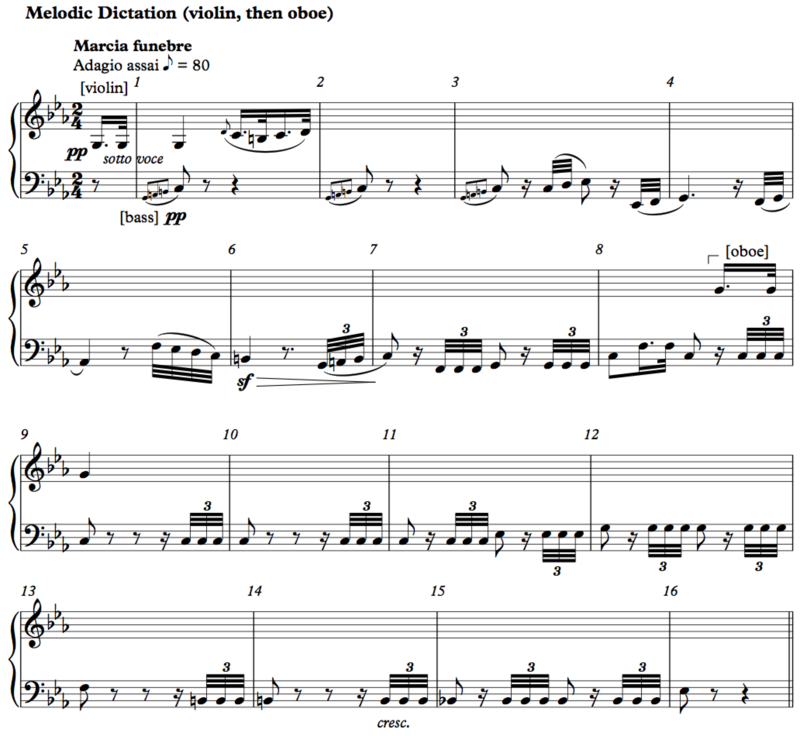 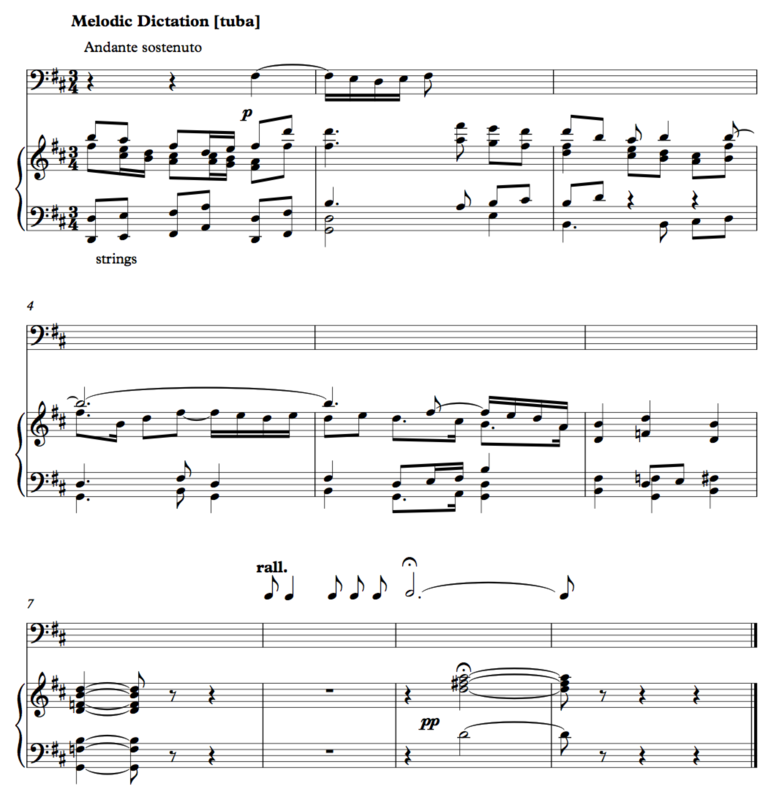 Because students usually already know them, the first part of dictation (memorization) is already taken care of, and students can focus on transcribing the melody into scale degrees and then into a particular key.